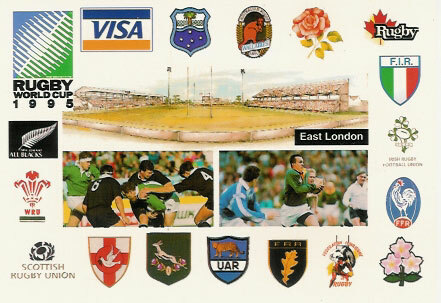 Modern rugby postcards from around the world, a great selection of cards, scroll down to see the selection on offer. All cards are unused in good condition unless otherwise stated. 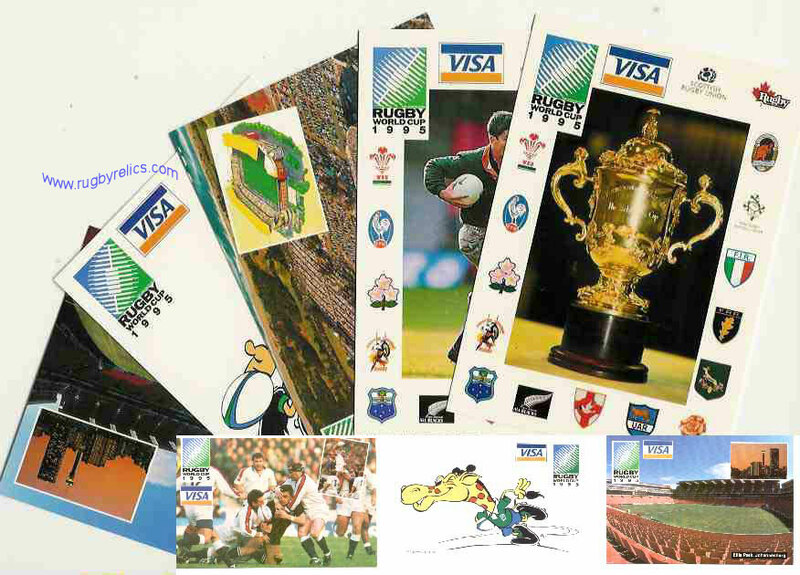 Set of 22 postcards (loose) published by Procard in South Africa for the 1995 Rugby World Cup, the cards are a mixture of Stadia, players, mascot illustrations, a great set of cards in mint condition. 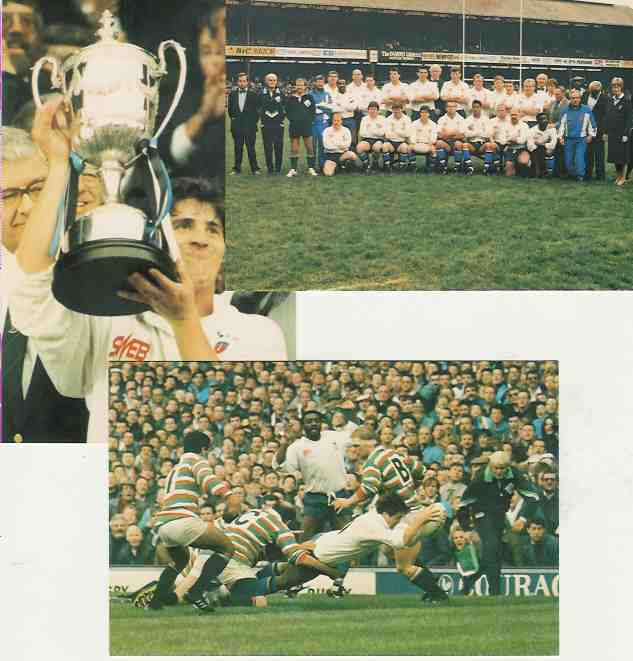 Bath RFC Pilkington Cup Final 1989 - set of 3 postcards by Enterprise Sport. No 1. Bath Squad, 2. 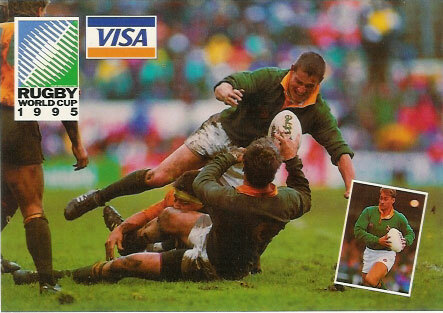 The winning try, 3. 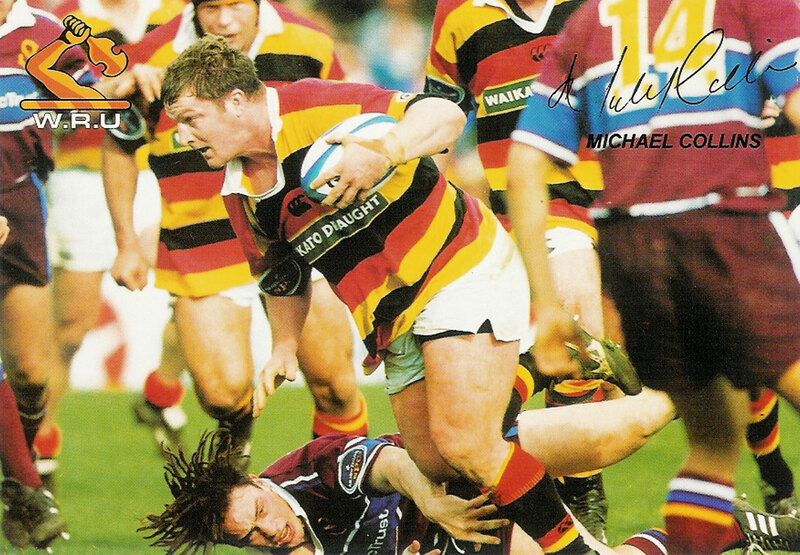 Stuart Barnes lifts trophy. 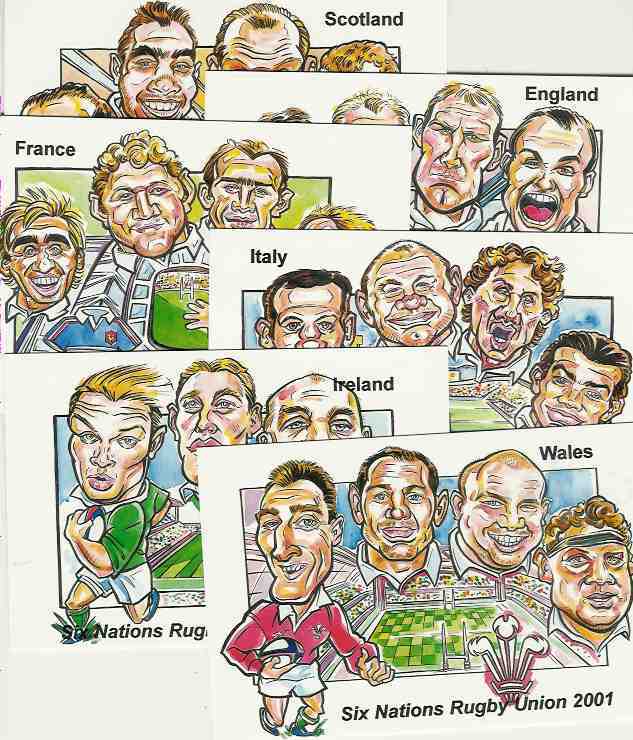 Six Nations 2001 - a set of 6 postcards, published by Brian Lund and designed by Michael O'Brien, Each postcard depicts the players and stadia of a 6 nations team. 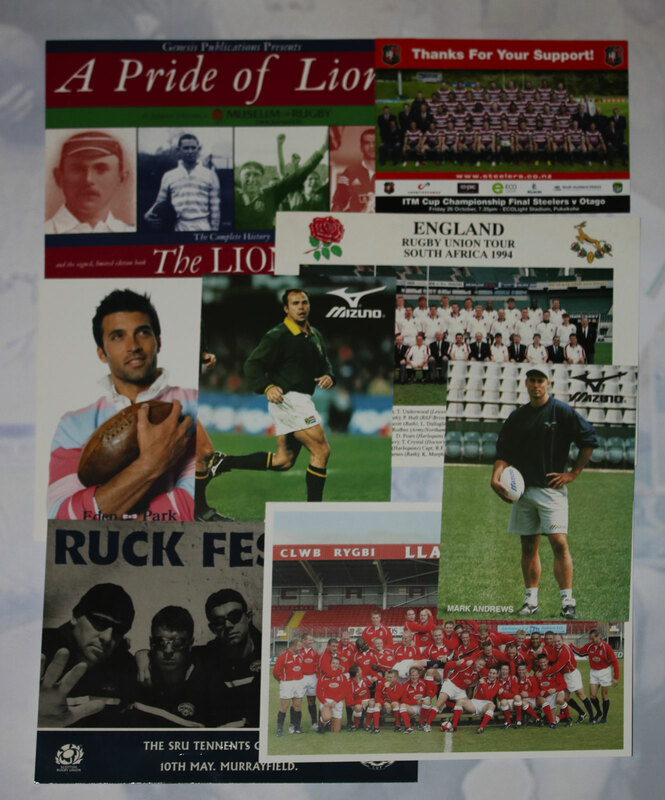 A set of 5 postcards relating to the origin of the game at Rugby School. 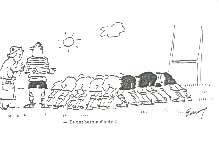 Each illustration was drawn by Charles Harcourt Chambers who entered the school in 1940 at the age of 13. 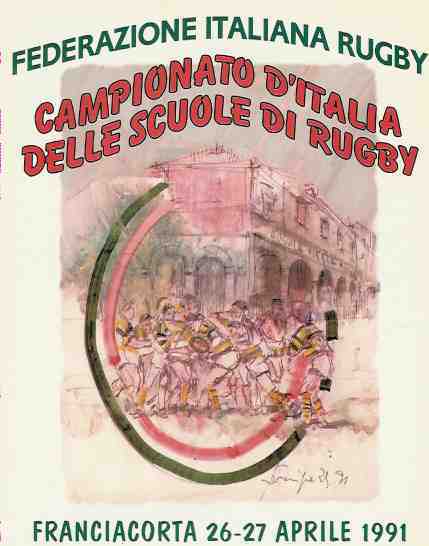 The five drawings which Chambers made to illustrate various points of play are the earliest surviving illustrations of football at Rugby. 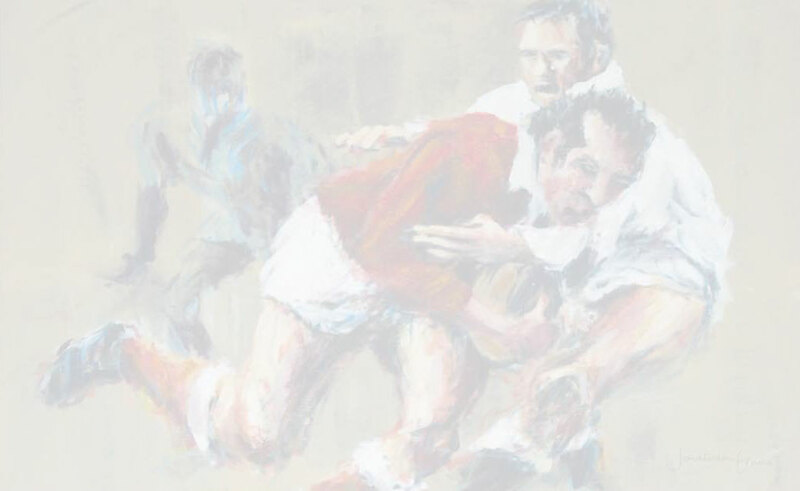 Included with the cards is an additional sheet with further information and a facsimile booklet containing the first laws of rugby drawn up in 1845. These items are as new without any noted faults. 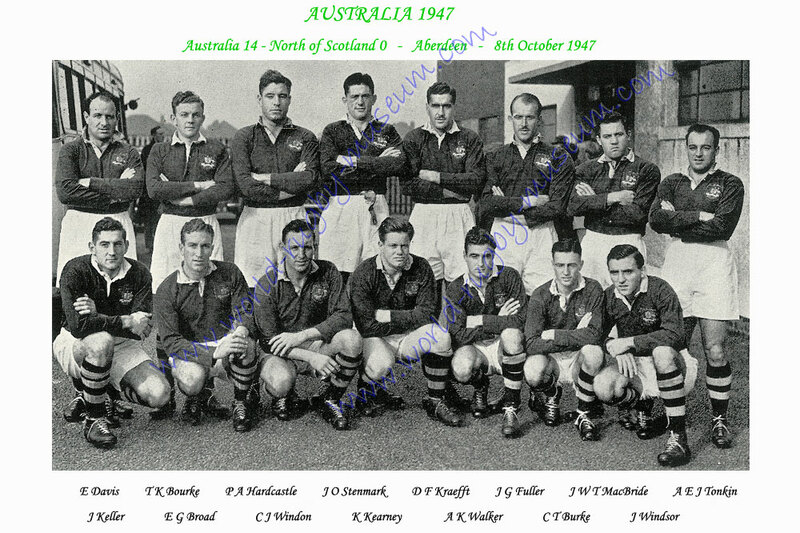 New Zealand - Carisbrook - House of Pain published by Kiwi Vista - 7 x 5"
Australia 1947 - A postcard of the Australian Team that played North of Scotland on 8th October 1947. The players are named. 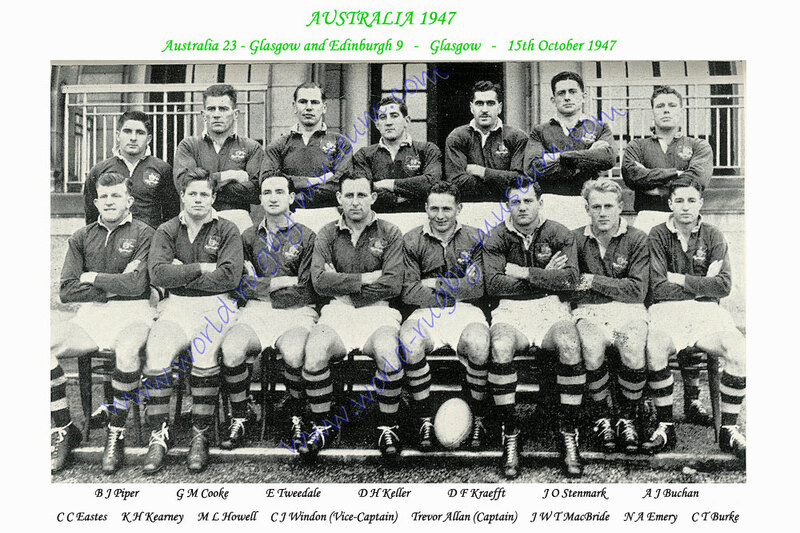 Australia 1947 - A postcard of the Australian Team that played Glasgow and Edinburgh on 15th October 1947.The players are named. 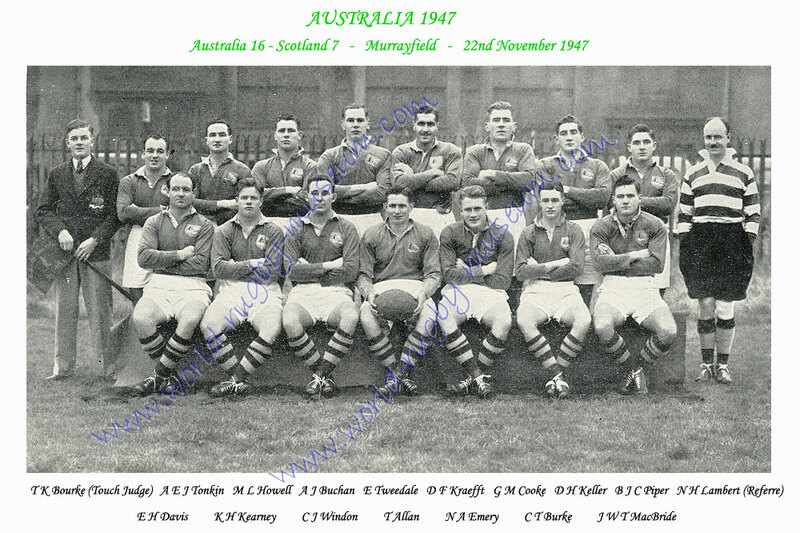 Australia 1947 - A postcard of the Australian Team that played Scotland on 22nd November 1947. The players are named. 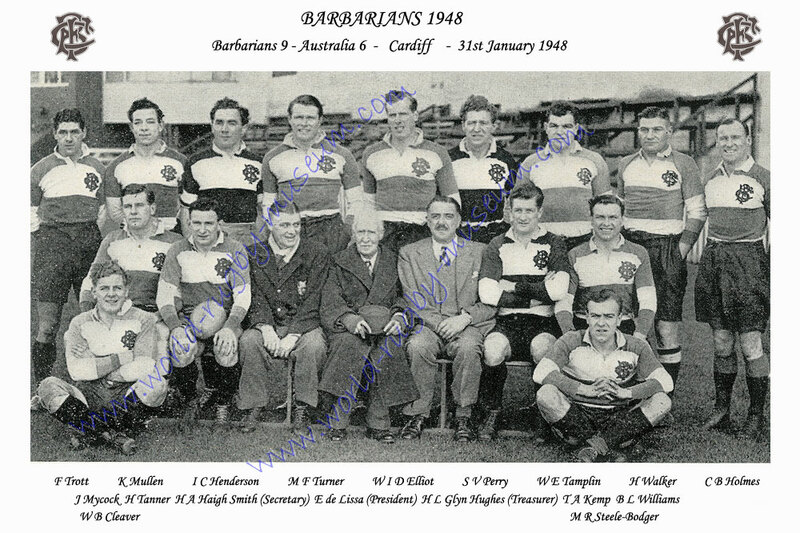 Barbarians 1948 - A postcard of the Barbarian Team that played Australia on 31st Jan 1948. The players are named. 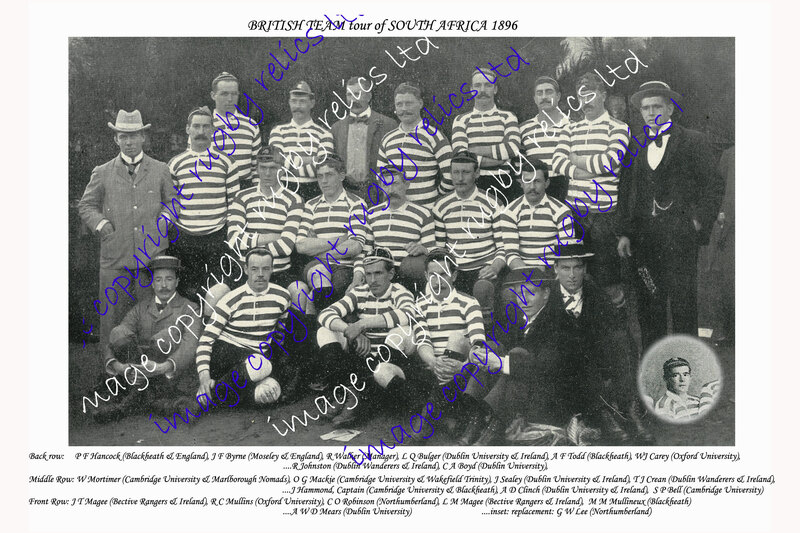 British Isles 1896 - A postcard of the British Isles squad that toured South Africa in 1896. The players are named. 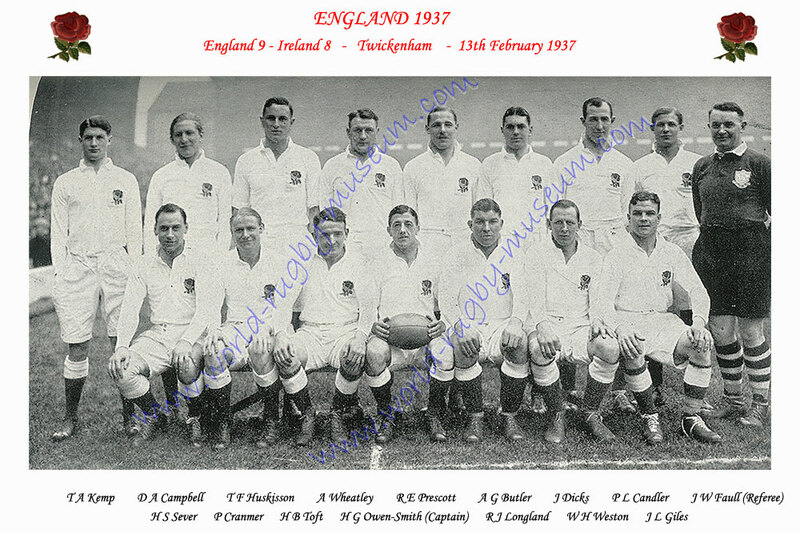 England 1935 - A postcard of the English Team that played Ireland on 9th February 1935. The players are named. 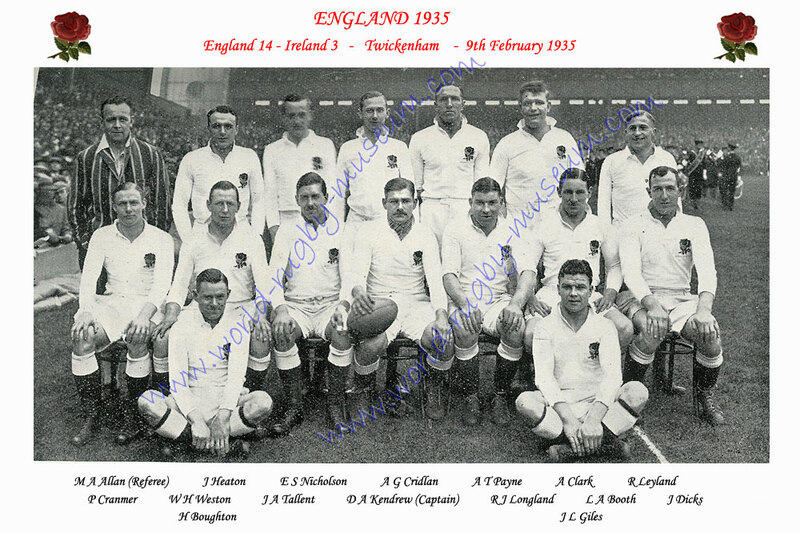 England 1937 - A postcard of the English Team that played Ireland on 13th February 1937. The players are named. 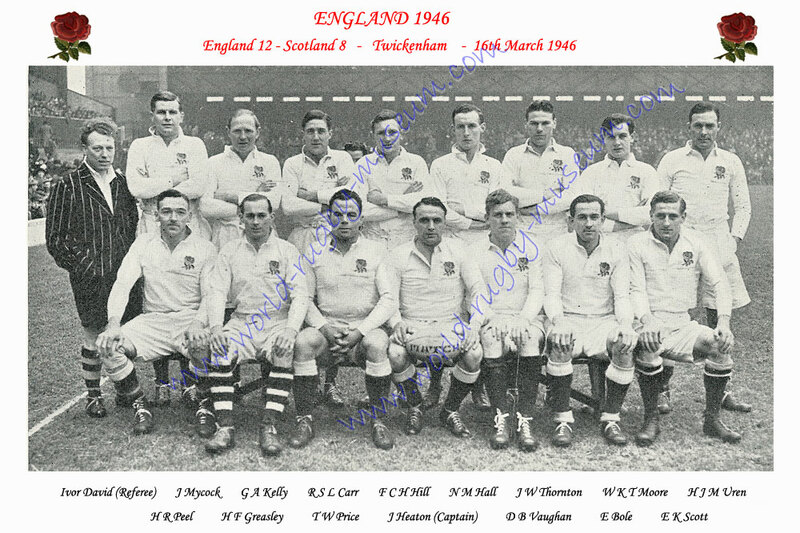 England 1946 - A postcard of the English Team that played Scotland on 16th March 1946. The players are named. 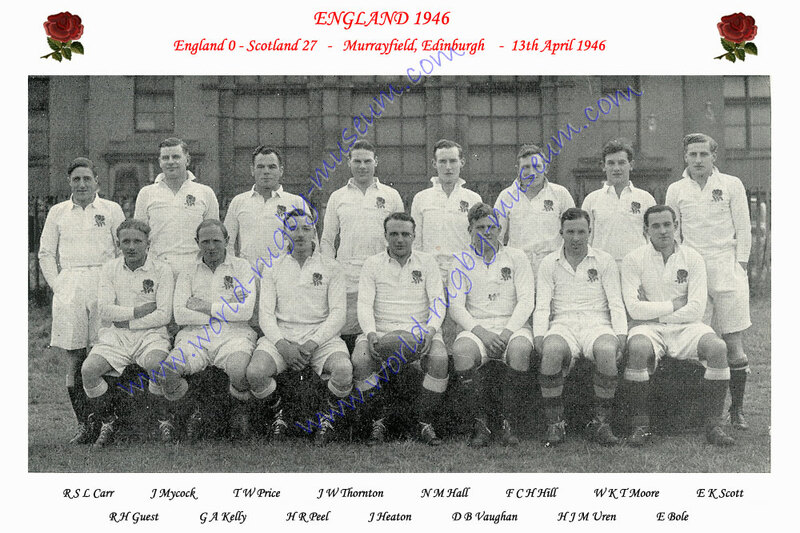 England 1946 - A postcard of the English Team that played Scotland on 13th April 1946. The players are named. 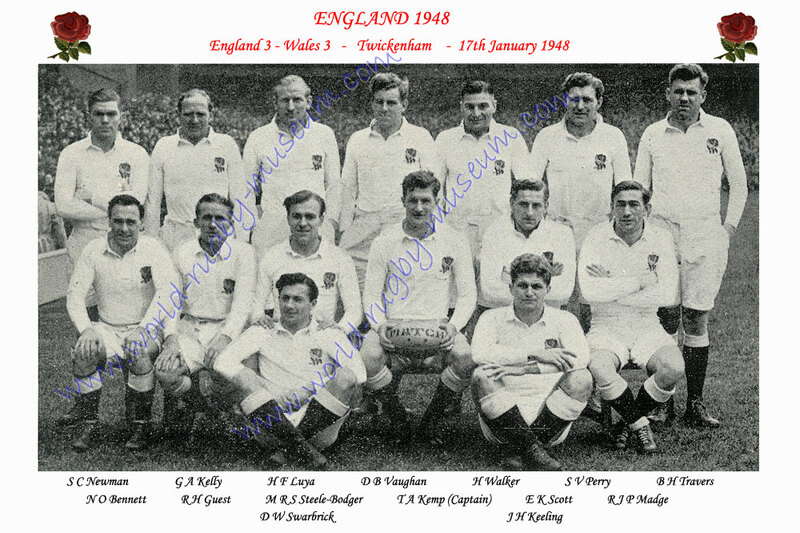 England 1948 - A postcard of the English Team that played Wales on 17th January 1948. The players are named. 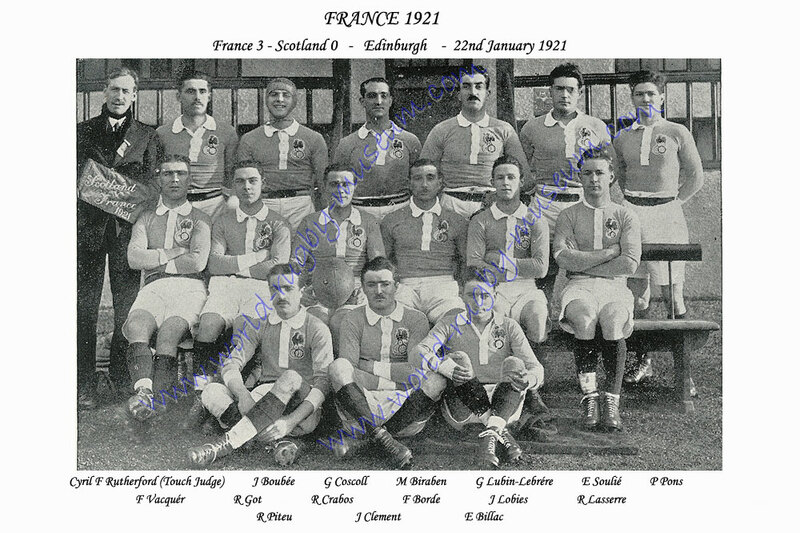 France 1921 - A postcard of the French Team that played Scotland on 22nd January 1921. The players are named. 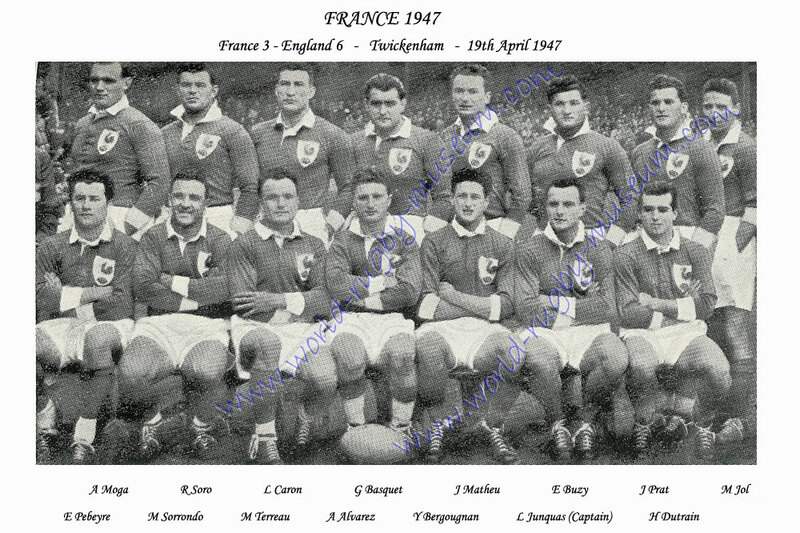 France 1947 - A postcard of the French Team that played England on 19th April 1947. The players are named. 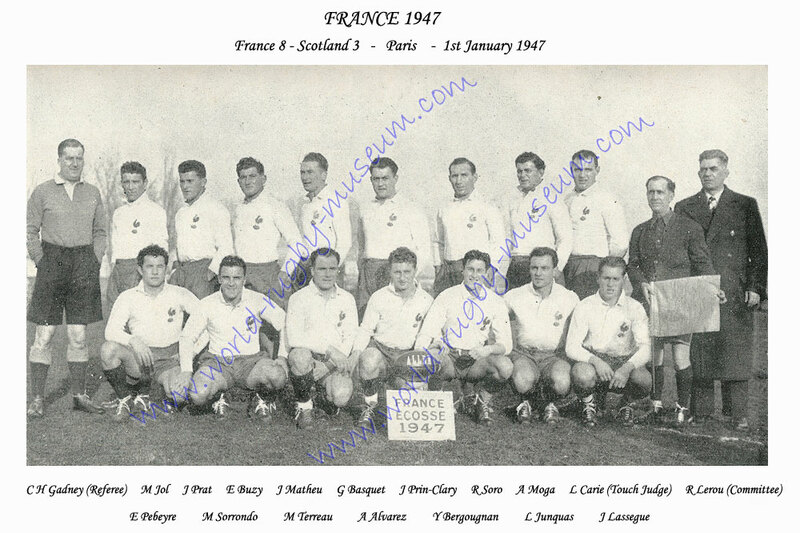 France 1947 - A postcard of the French Team that played Scotland on 1st January 1947. The players are named. 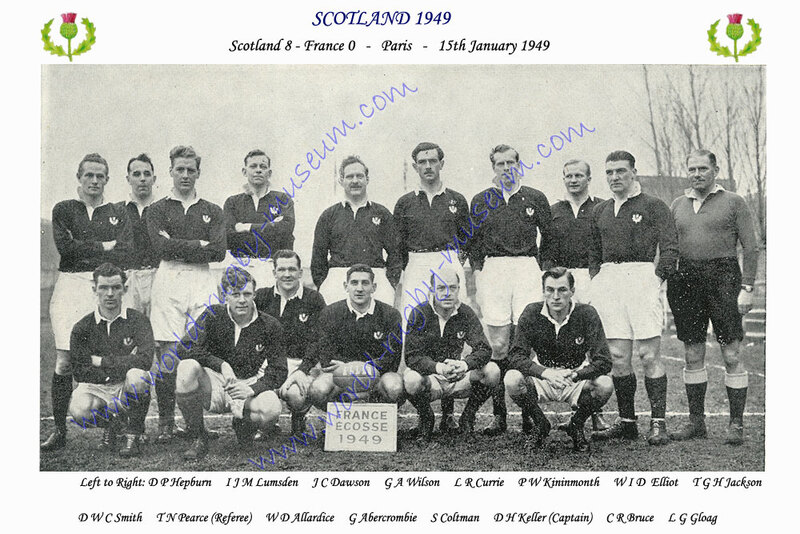 France 1949 - A postcard of the French Team that played Scotland on 15th January 1949. The players are named. 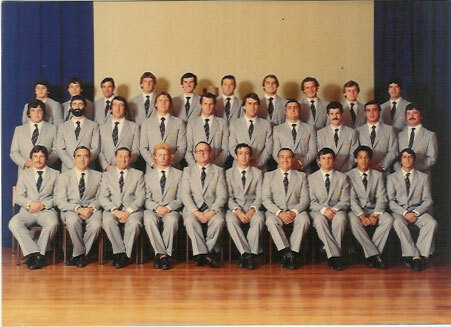 France 1979 - A Postcard of the French Touring Team in New Zealand 1979. 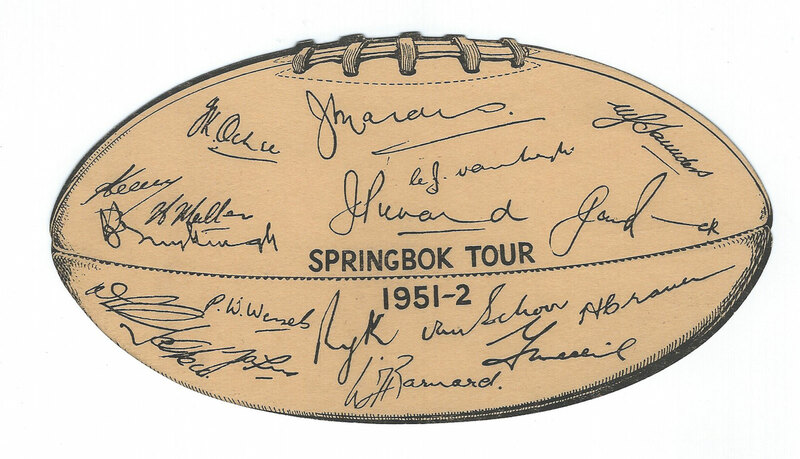 Printed signatures on the back. 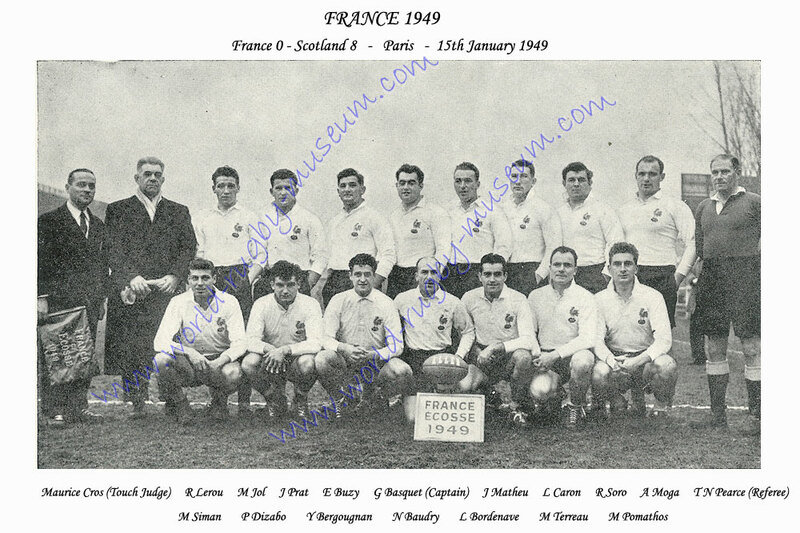 France 1987 - Large French postcard, pictures the 1987 French World Cup squad. 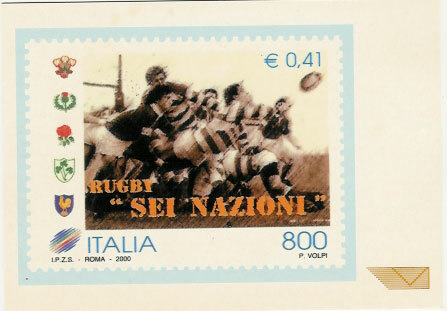 Postally used, good condition. 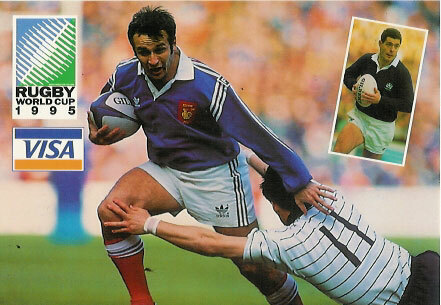 France 1989 - Large French postcard, pictures the French squad that toured New Zealand in 1989. Postally unused, bumped corners. 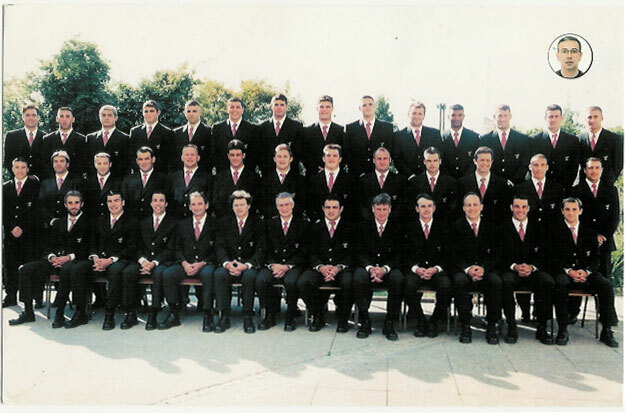 France 1991 - Large French postcard, pictures the French squad that toured the USA in 1991. Postally unused, good condition. 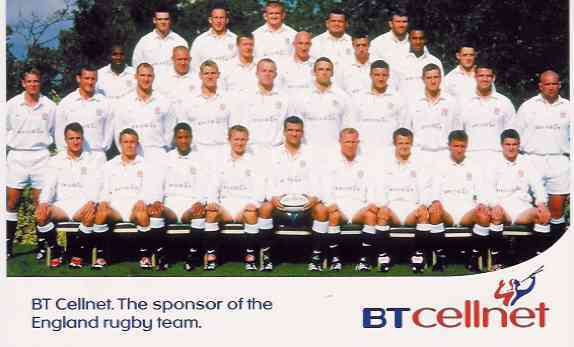 France 1999 - A Large Postcard of the French Touring Team in Samoa, Tonga and New Zealand 1999. 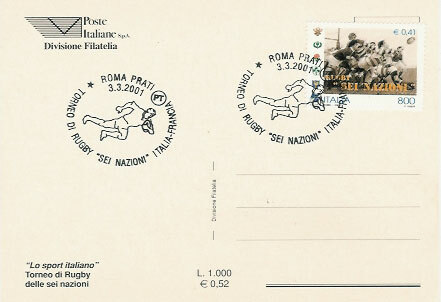 Printed signatures on the back. 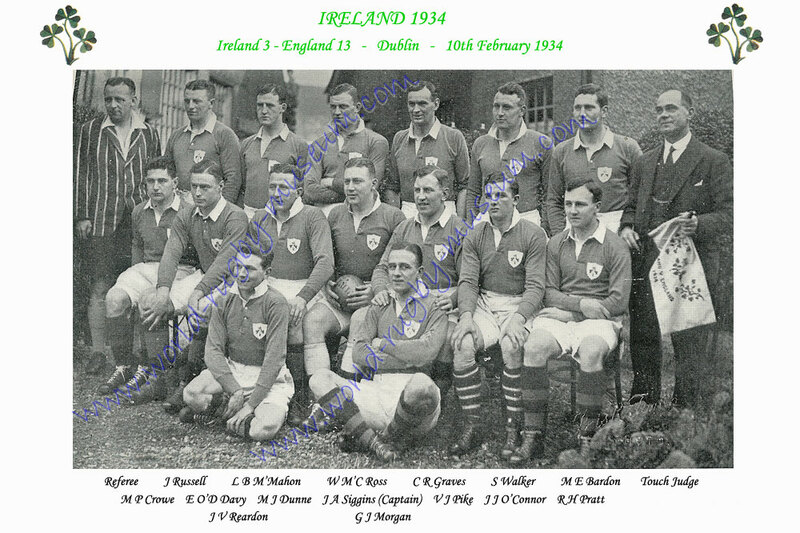 Ireland 1934 - A postcard of the Irish Team that played England on 10th February 1934. The players are named. 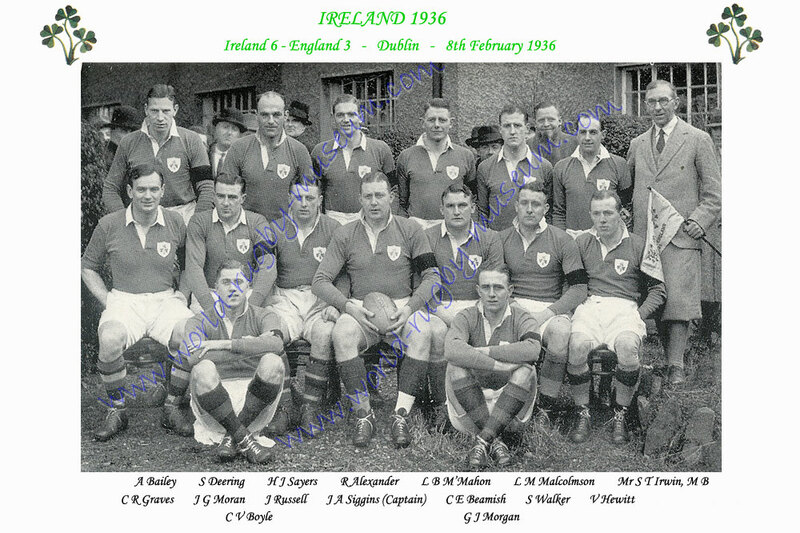 Ireland 1936 - A postcard of the Irish Team that played England on 8th February 1936. The players are named. 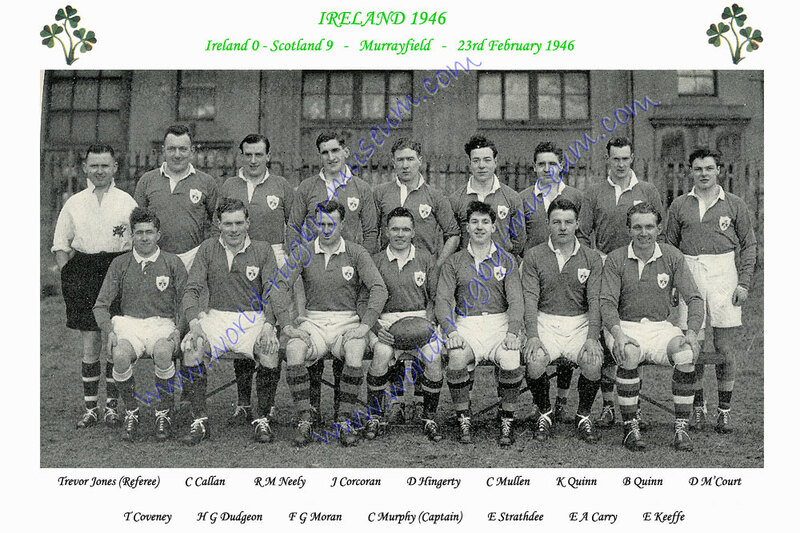 Ireland 1948 Grand Slam Season - A postcard of the Irish Team that played Scotland on 28th February 1948. The players are named. 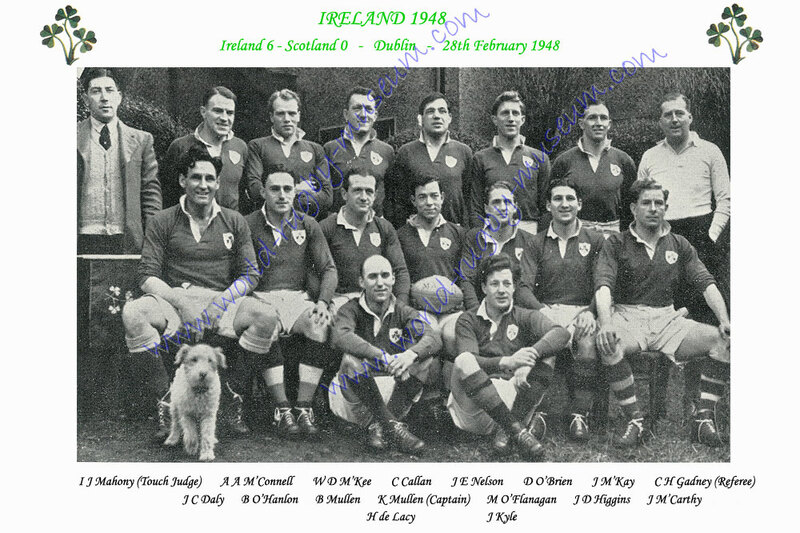 Ireland 1946 - A postcard of the Irish Team that played Scotland on 23rd February 1946. The players are named. 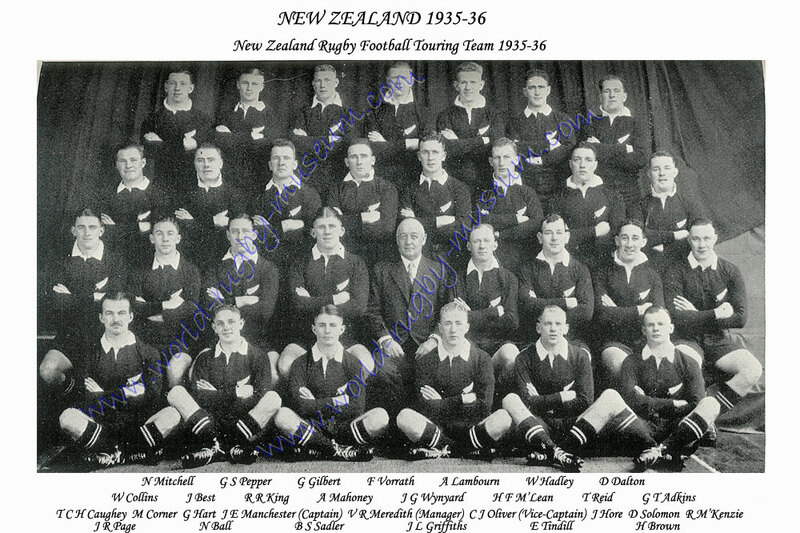 New Zealand 1935-36 - A postcard of the New Zealand Touring Team 1935-36. The players are named. 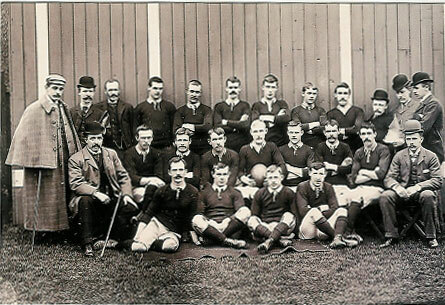 Scotland 1894 - A postcard of the Scottish team that played England on 17th March 1894. The players are named. 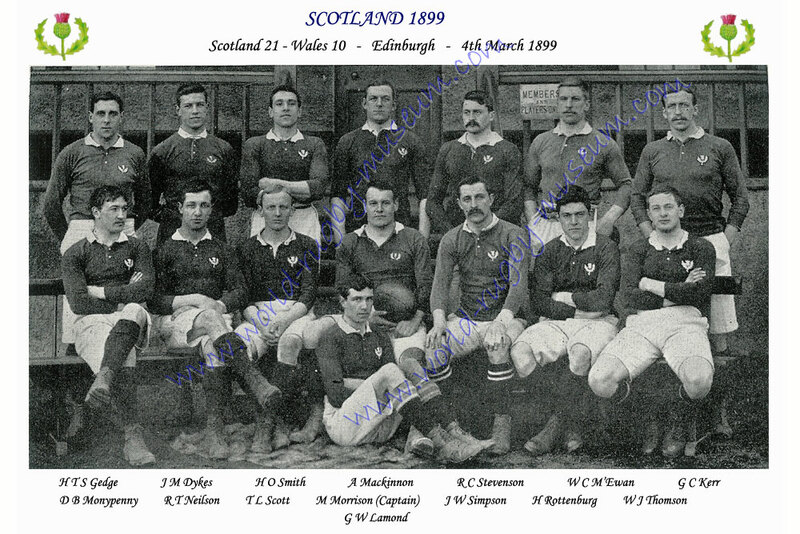 Scotland 1899 - A postcard of the Scottish team that played Wales on 4th March 1899. The players are named. 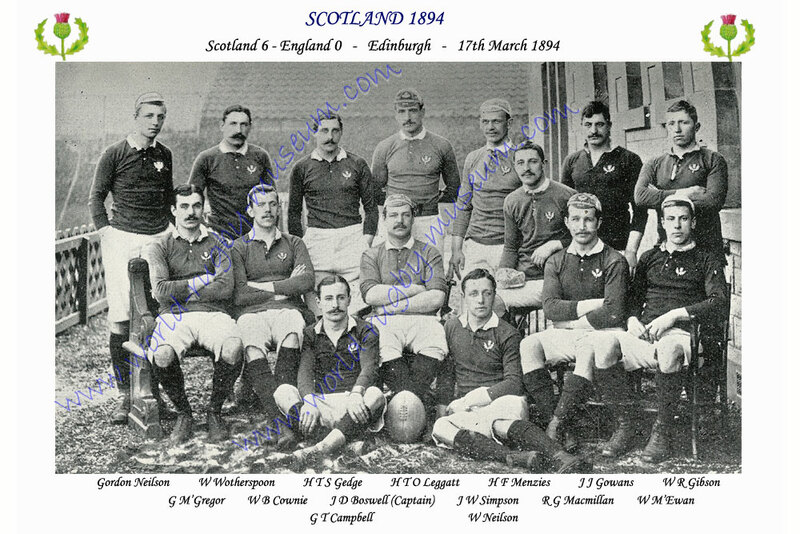 Scotland 1900 - A postcard of the Scottish team that played England on 10th March 1900. The players are named. 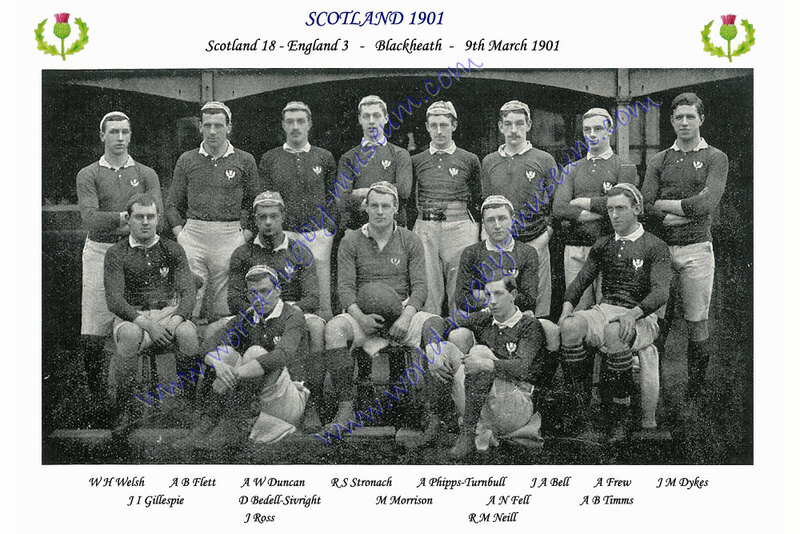 Scotland 1901 - A postcard of the Scottish team that played England on 9th March 1901. The players are named. 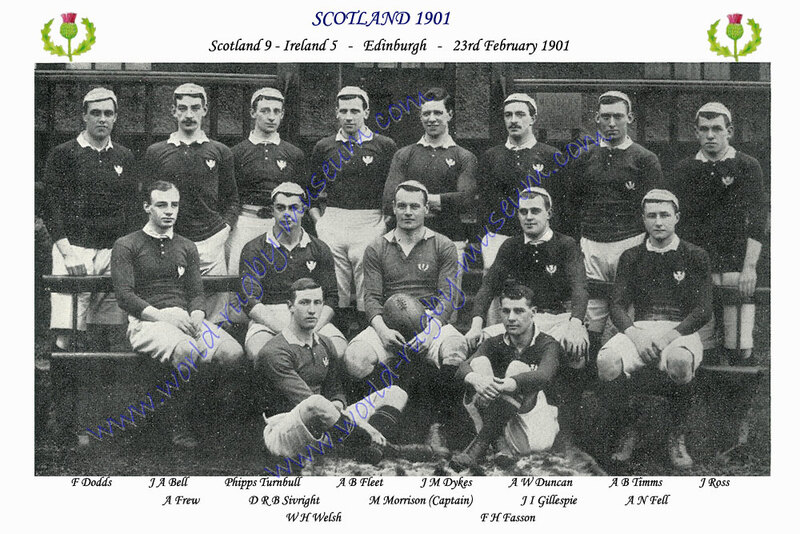 Scotland 1901 - A postcard of the Scottish team that played Ireland 23rd February 1901. The players are named. 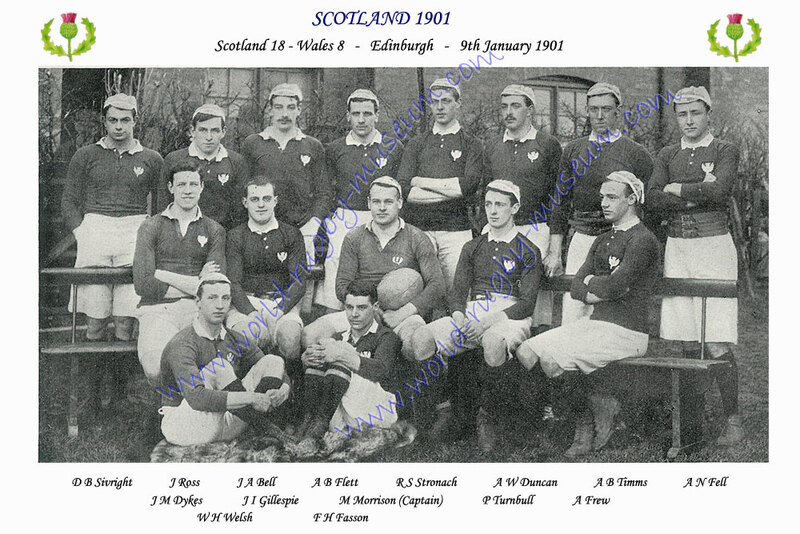 Scotland 1901 - A postcard of the Scottish team that played Wales on 9th January 1901. The players are named. 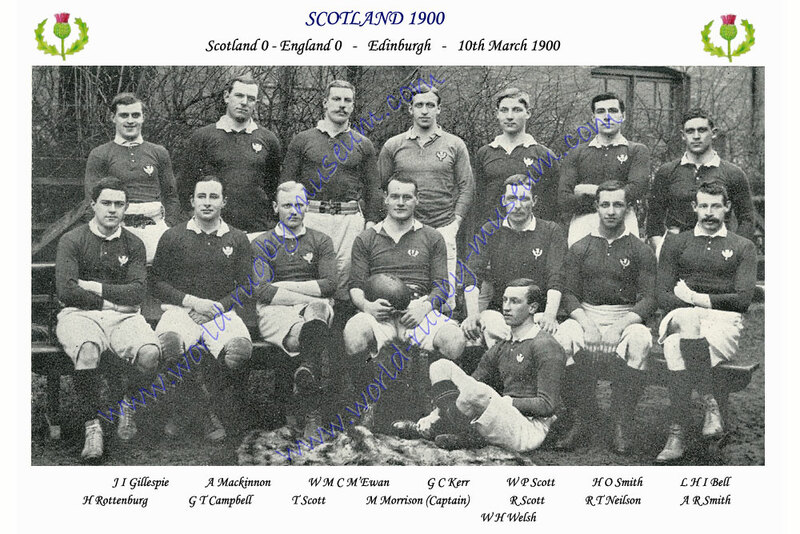 Scotland 1903 - A postcard of the Scottish team that played England on 21st March 1903. The players are named. 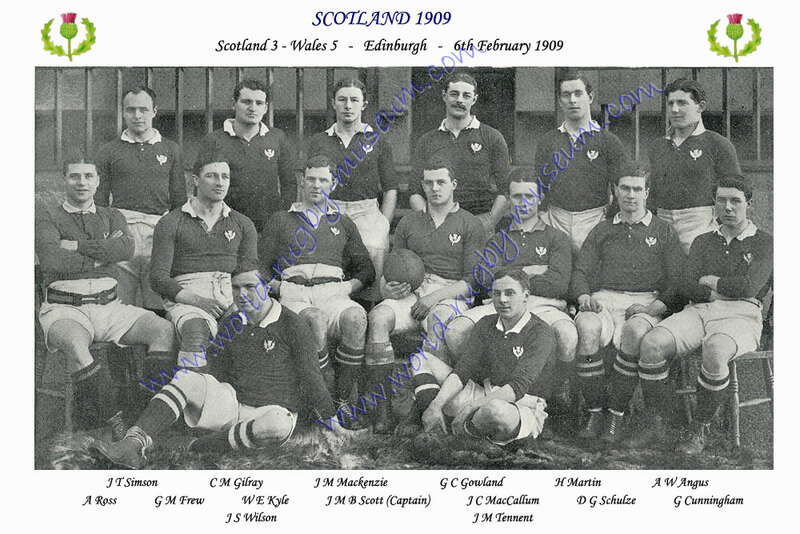 Scotland 1903 - A postcard of the Scottish team that played Wales on 7th February 1903. The players are named. 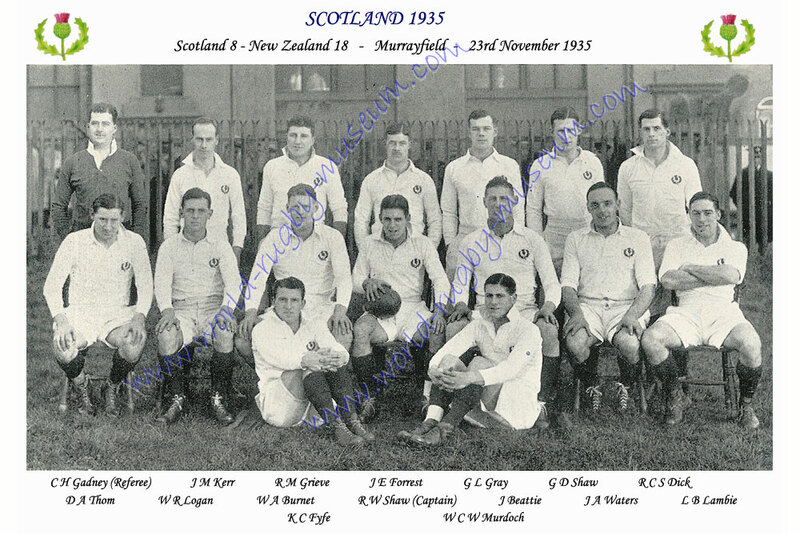 Scotland 1905 - A postcard of the Scottish team that played New Zealand on 18th November 1905. The players are named. 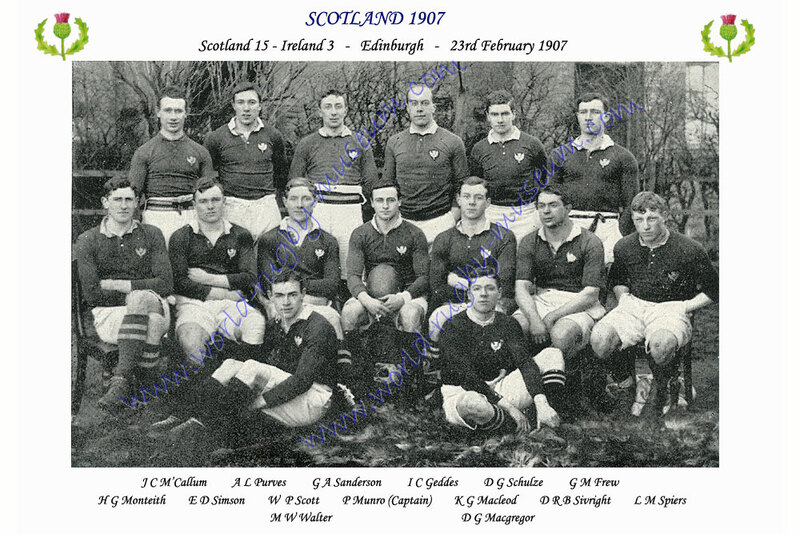 Scotland 1907 - A postcard of the Scottish team that played Ireland on 23rd February 1907. The players are named. 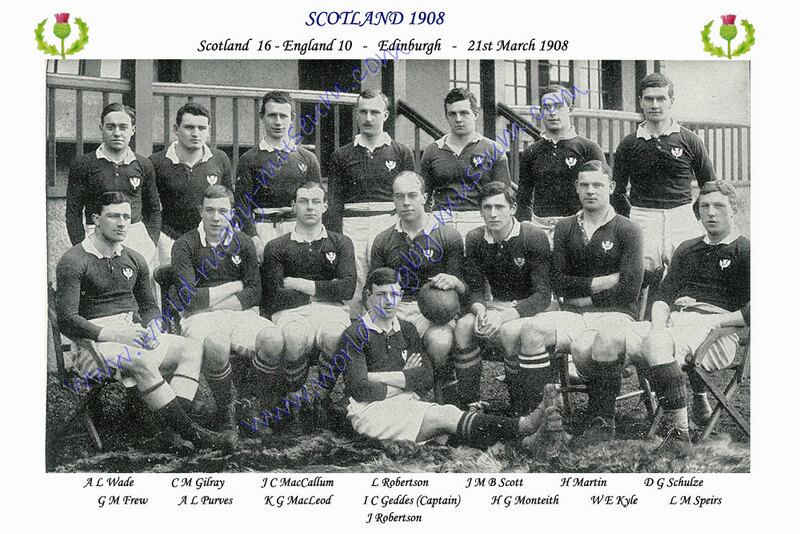 Scotland 1908 - A postcard of the Scottish team that played England on 21st March 1908. The players are named. 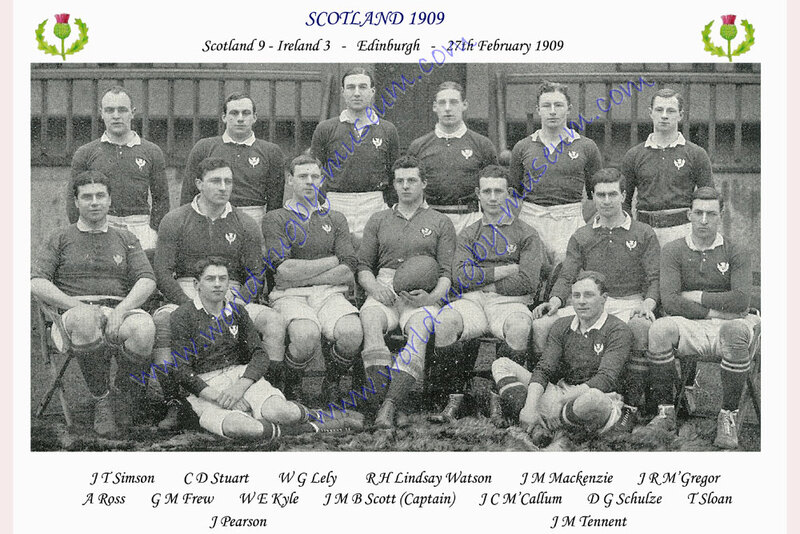 Scotland 1909 - A postcard of the Scottish team that played Ireland on 27th February 1909. The players are named. 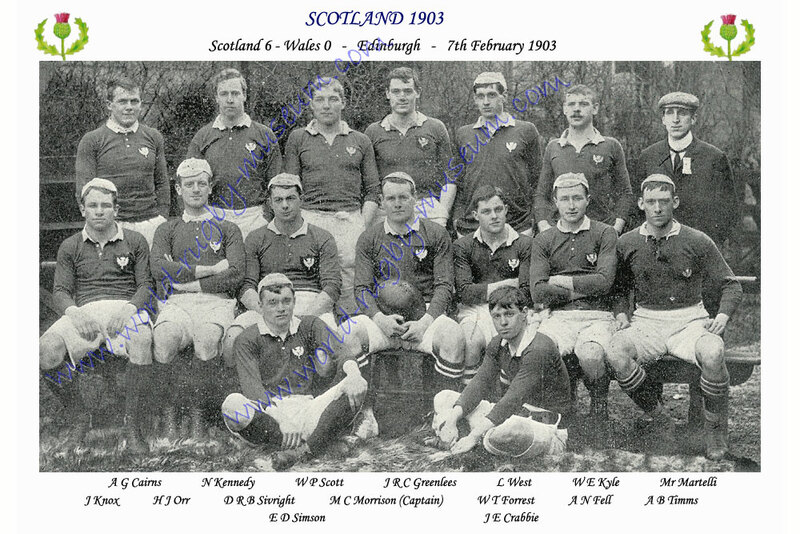 Scotland 1909 - A postcard of the Scottish team that played Wales on 6th February 1909. The players are named. 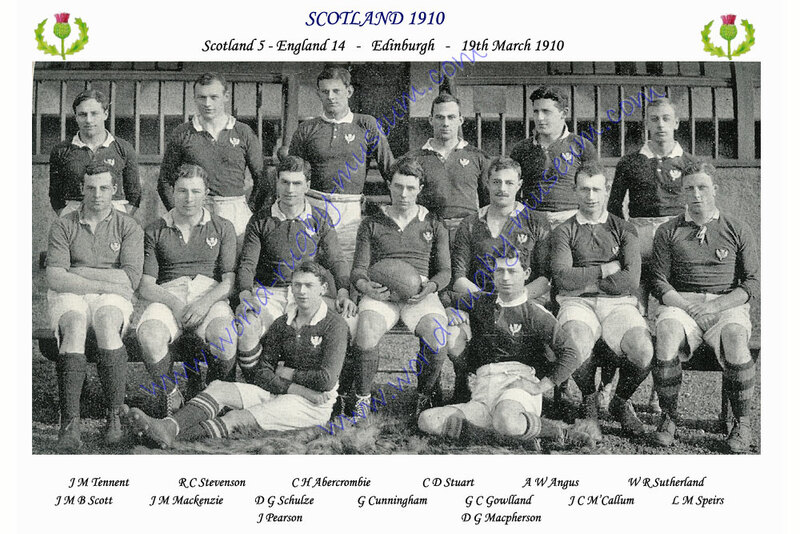 Scotland 1910 - A postcard of the Scottish team that played England on 19th March 1910. The players are named. 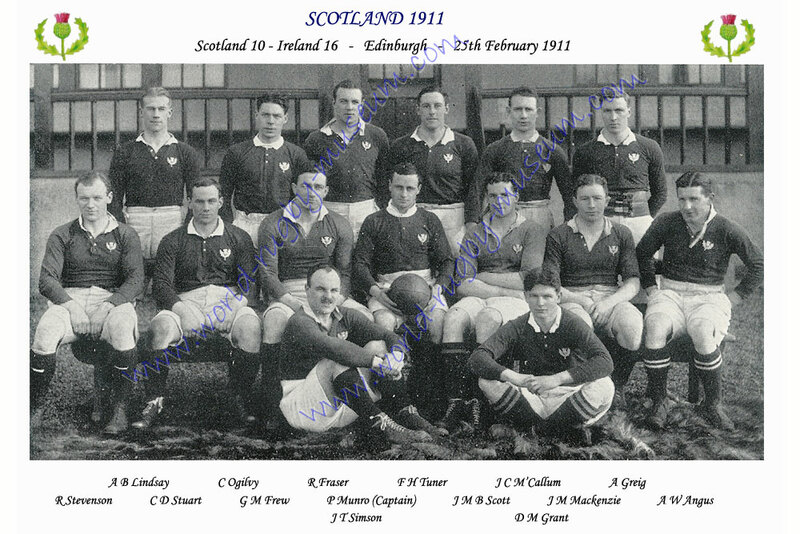 Scotland 1911 - A postcard of the Scottish team that played Ireland on 25th February 1911. The players are named. 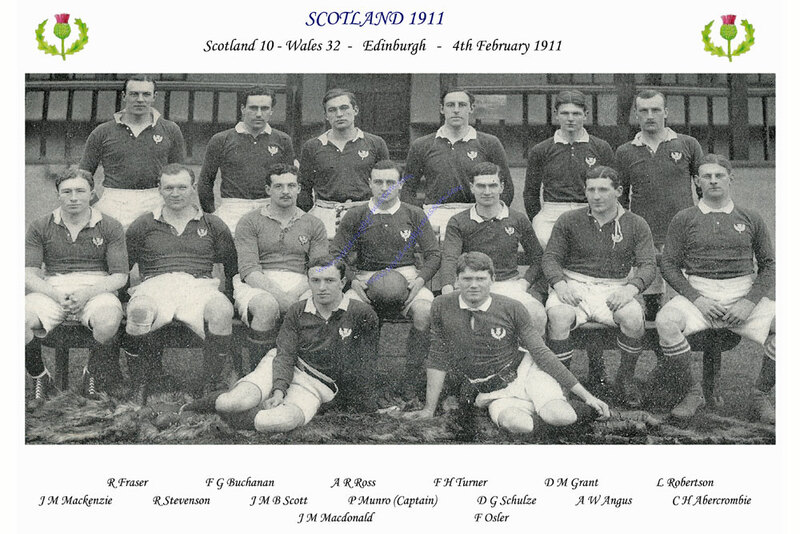 Scotland 1911 - A postcard of the Scottish team that played Wales on 4th February 1911. The players are named. 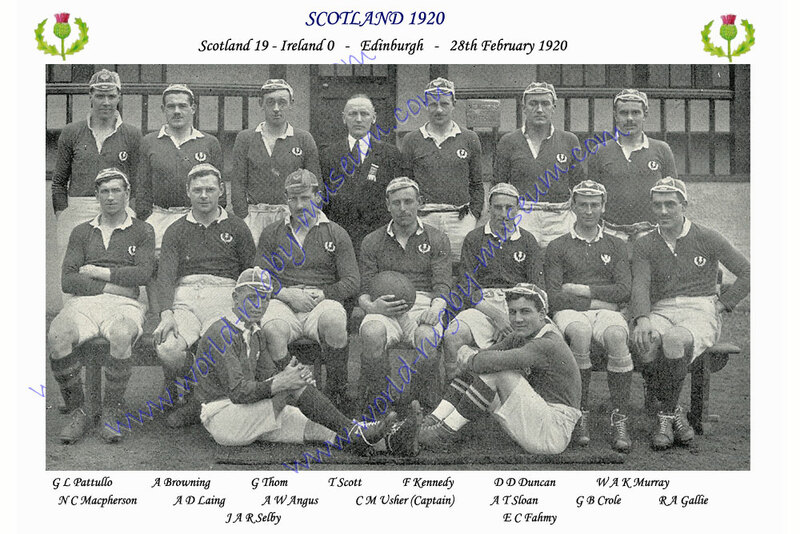 Scotland 1920 - A postcard of the Scottish team that played Ireland on 28th February 1920. The players are named. 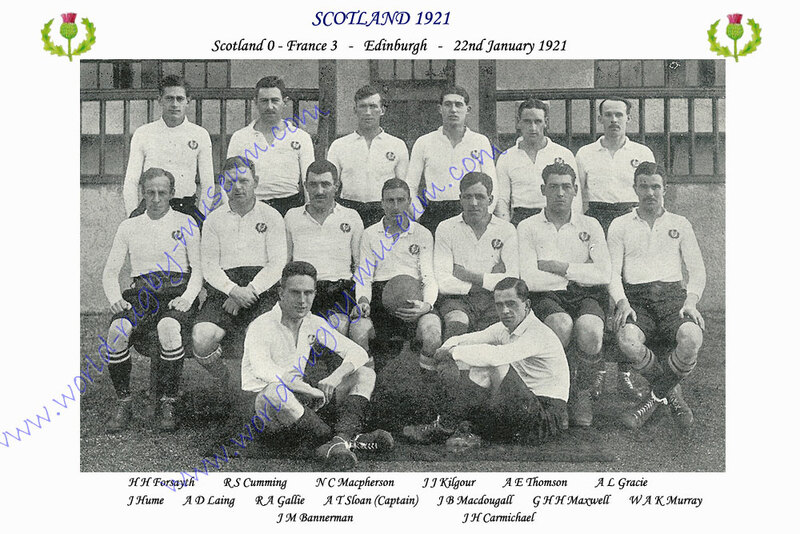 Scotland 1921 - A postcard of the Scottish team that played France on 22nd January 1921. The players are named. 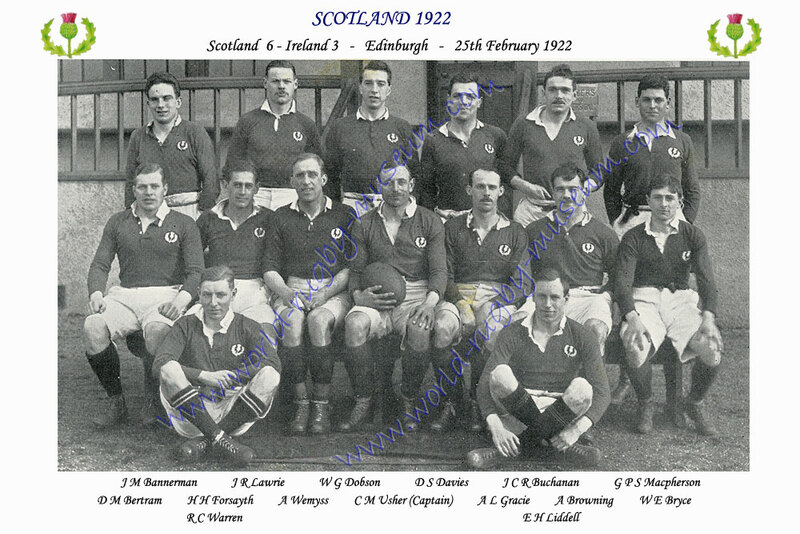 Scotland 1922 - A postcard of the Scottish team that played Ireland 25th February 1922. The players are named. 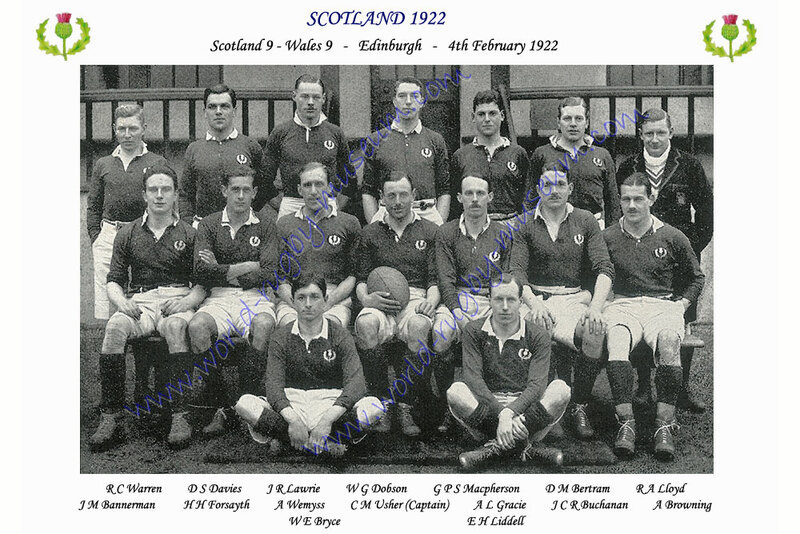 Scotland 1922 - A postcard of the Scottish team that played Wales 4th February 1922. The players are named. 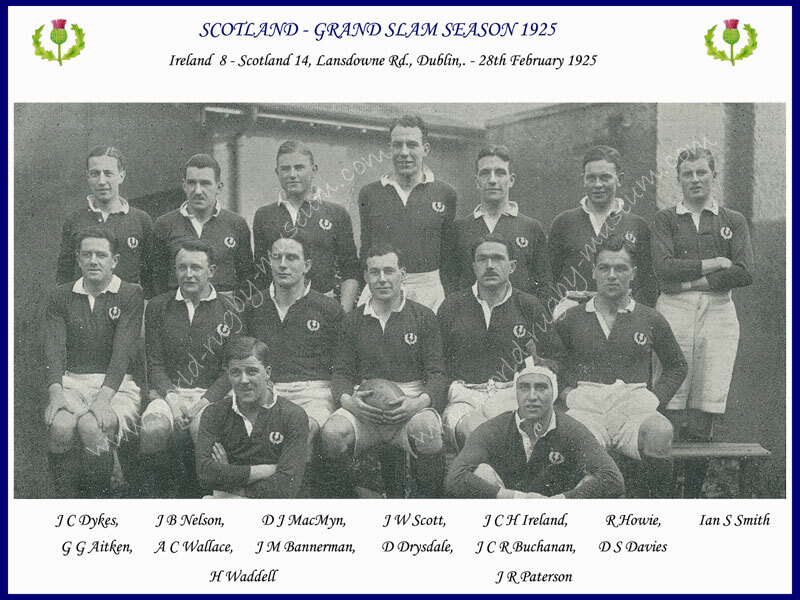 Scotland 1925 - A postcard of the Scottish team that faced Ireland in Scotland's first ever Grand Slam Season on 28th February 1925. The players are named. 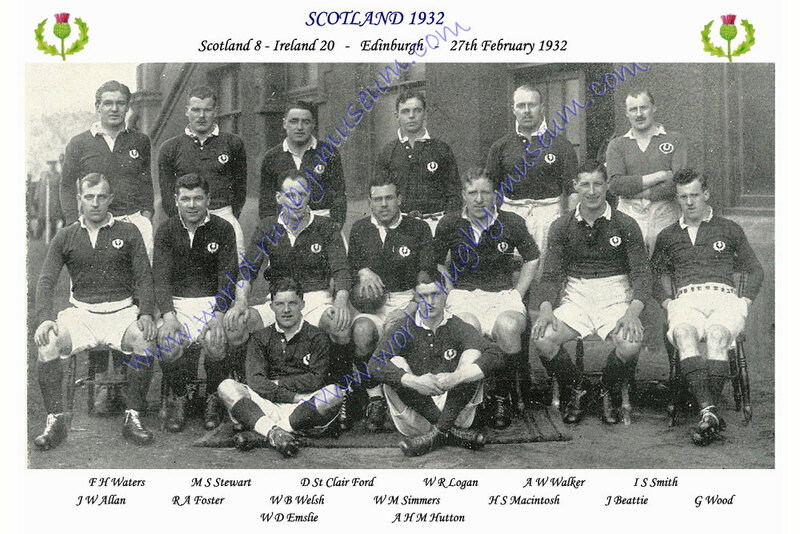 Scotland 1926 - A postcard of the Scottish team that played Ireland on 27th February 1926. The players are named. 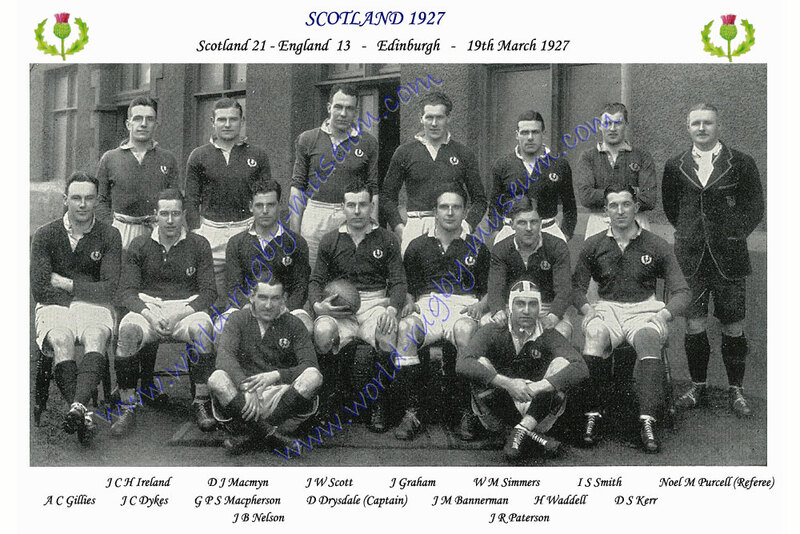 Scotland 1927 - A postcard of the Scottish team that played England on 19th March 1927. The players are named. 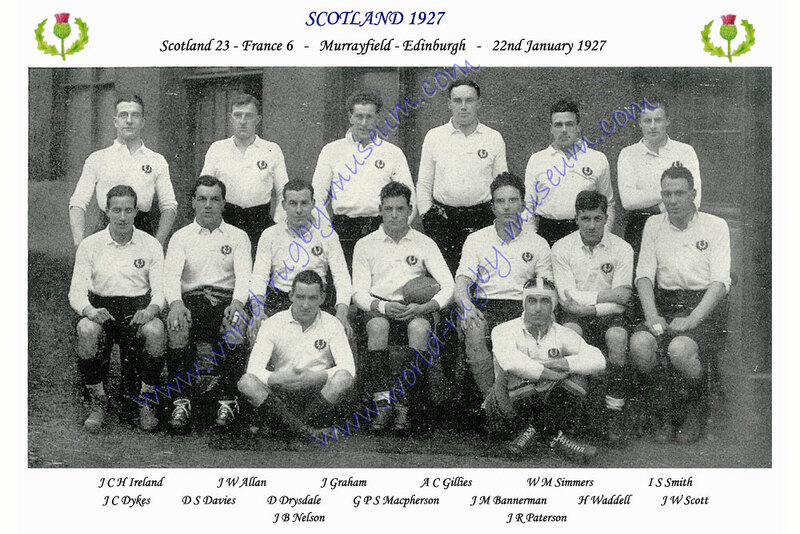 Scotland 1927 - A postcard of the Scottish team that played France on 22nd January 1927. The players are named. 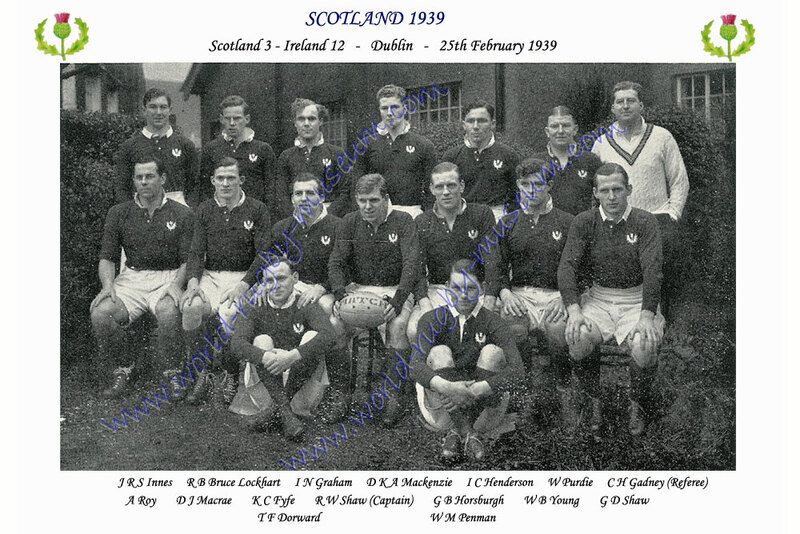 Scotland 1928 - A postcard of the Scottish team that played Ireland on 25th February 1928. The players are named. 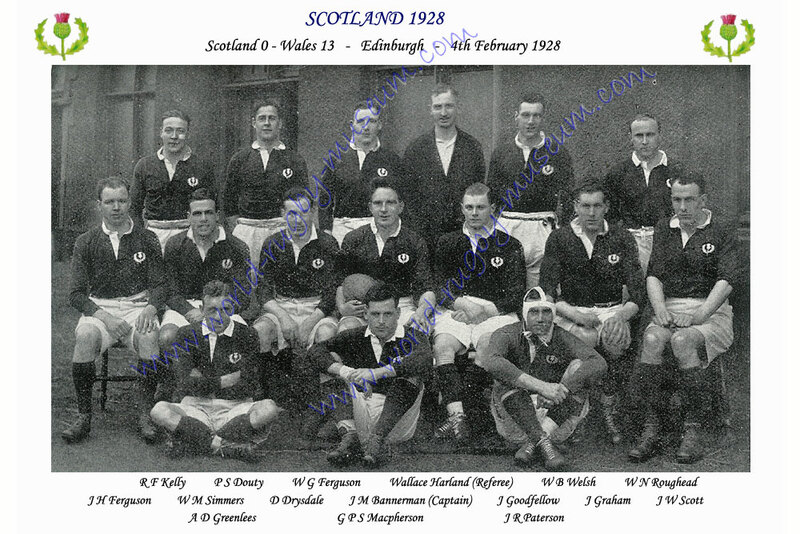 Scotland 1928 - A postcard of the Scottish team that played Wales on 4th February 1928. The players are named. 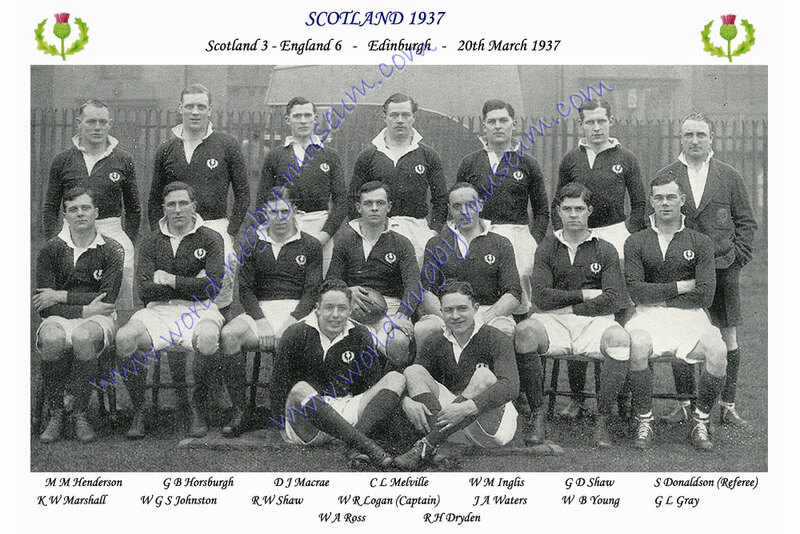 Scotland 1929 - A postcard of the Scottish team that played England on 16th March 1929. The players are named. 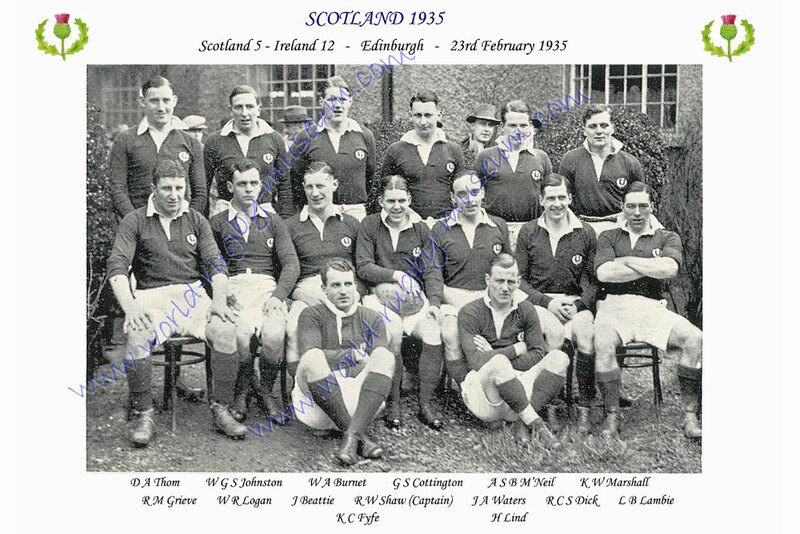 Scotland 1930 - A postcard of the Scottish team that played Ireland on 22nd February 1930. The players are named. 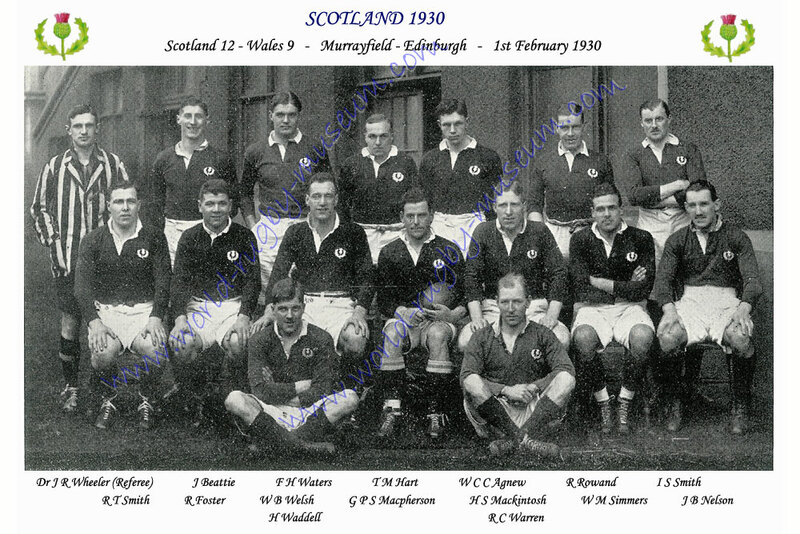 Scotland 1930 - A postcard of the Scottish team that played Wales on 1st February 1930. The players are named. 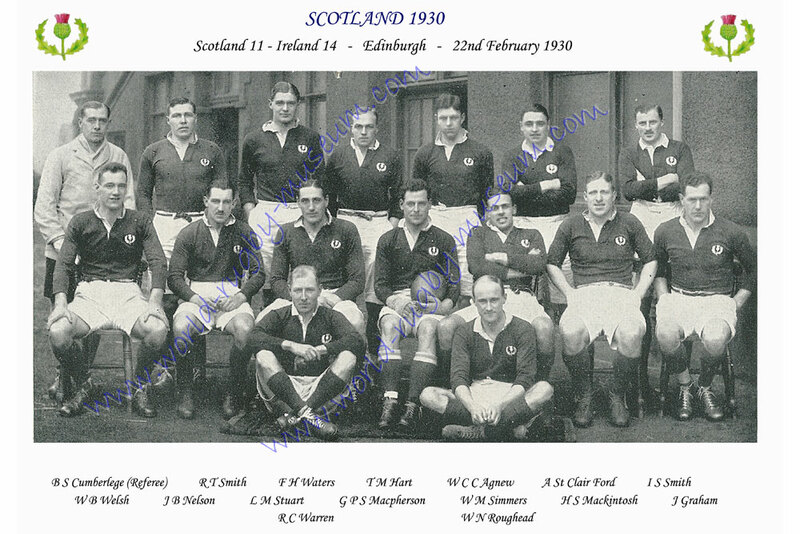 Scotland 1930 - A postcard of the Scottish team that played Ireland on 27th February 1932. The players are named. 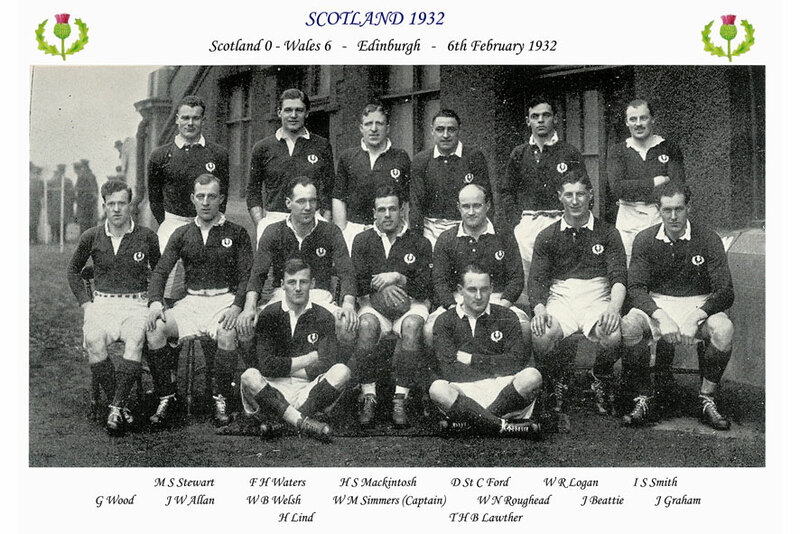 Scotland 1932 - A postcard of the Scottish team that played Wales on 6th February 1932. The players are named. 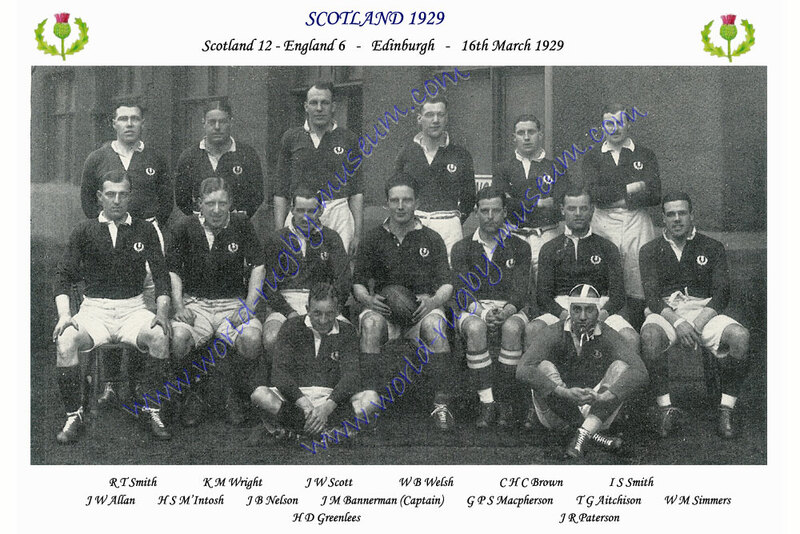 Scotland 1933 - A postcard of the Scottish team that played England on 18th March 1933. The players are named. 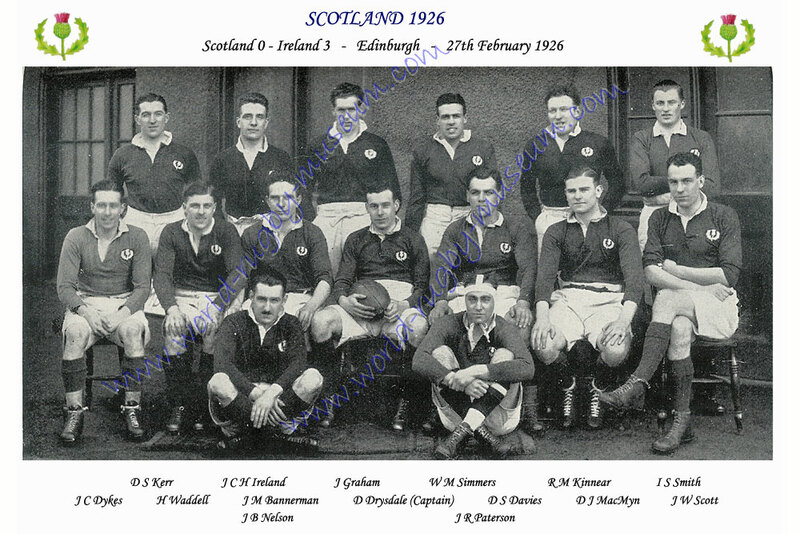 Scotland 1934 - A postcard of the Scottish team that played Ireland on 24th February 1934. The players are named. 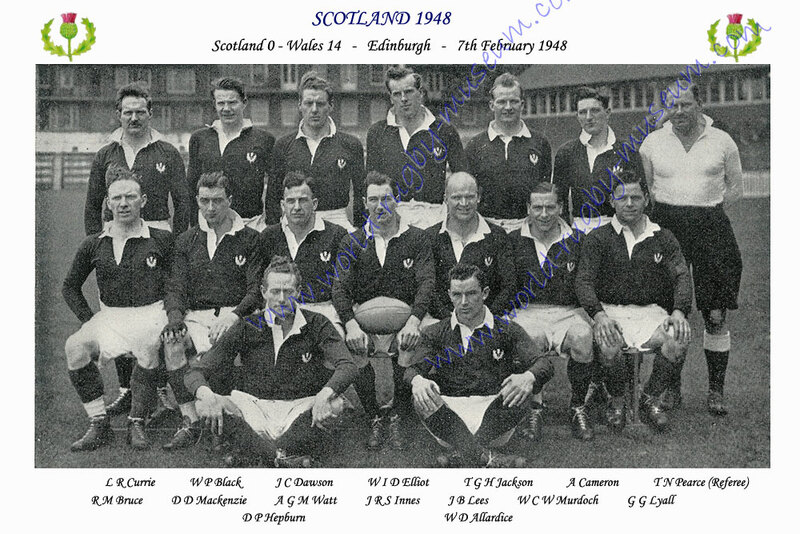 Scotland 1934 - A postcard of the Scottish team that played Wales on 3rd February 1934. The players are named. 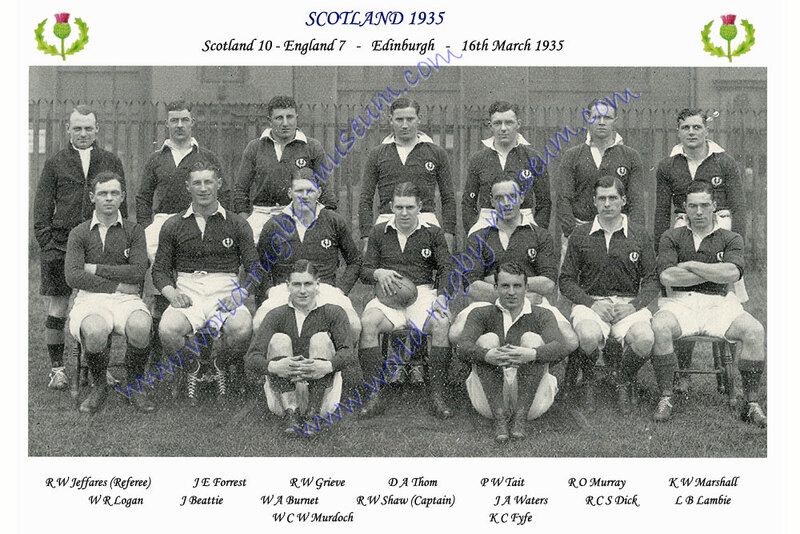 Scotland 1935 - A postcard of the Scottish team that played England on 16th March 1935. The players are named. 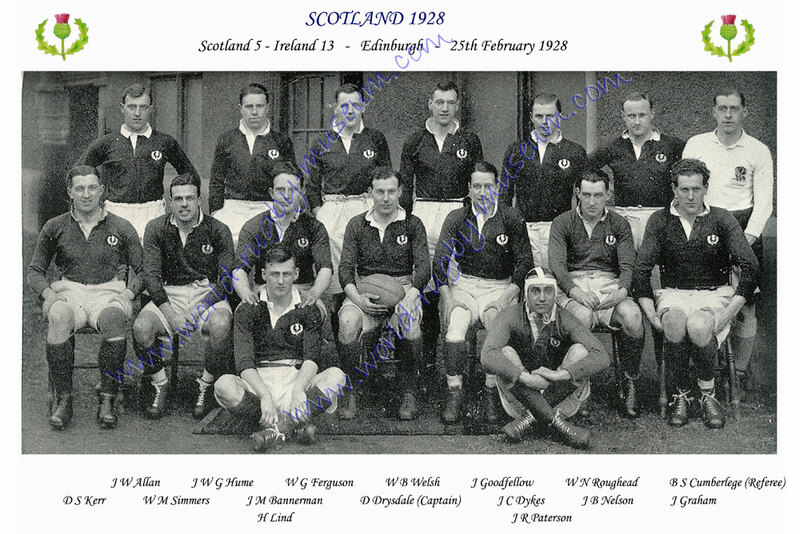 Scotland 1935 - A postcard of the Scottish team that played Ireland on 23rd February 1935. The players are named. 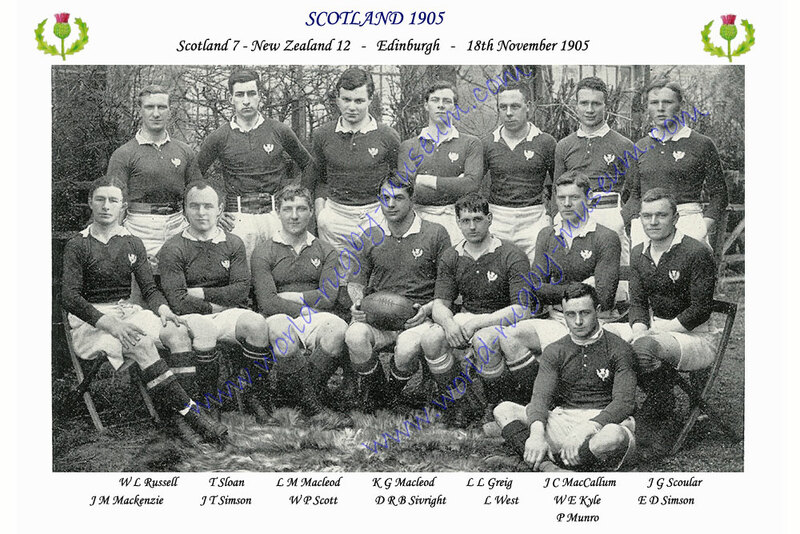 Scotland 1935 - A postcard of the Scottish team that played New Zealand on 23rd November 1935. The players are named. 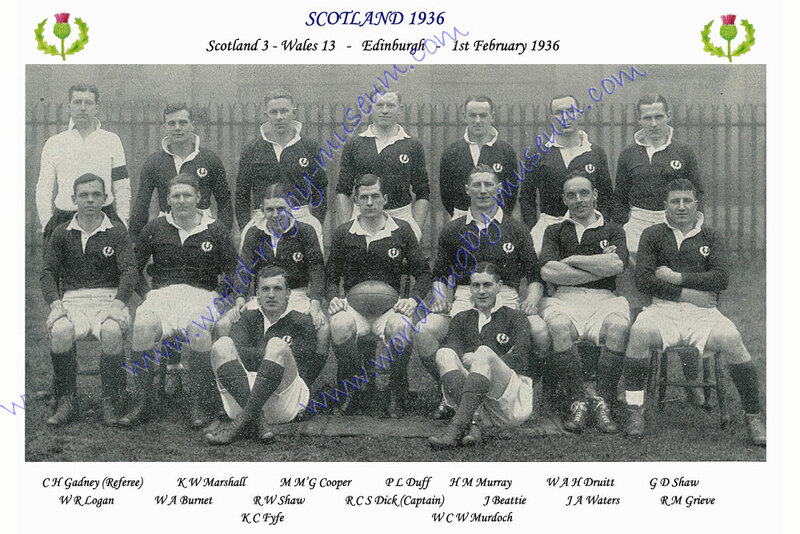 Scotland 1936 - A postcard of the Scottish team that played Wales on 1st February 1936. The players are named. 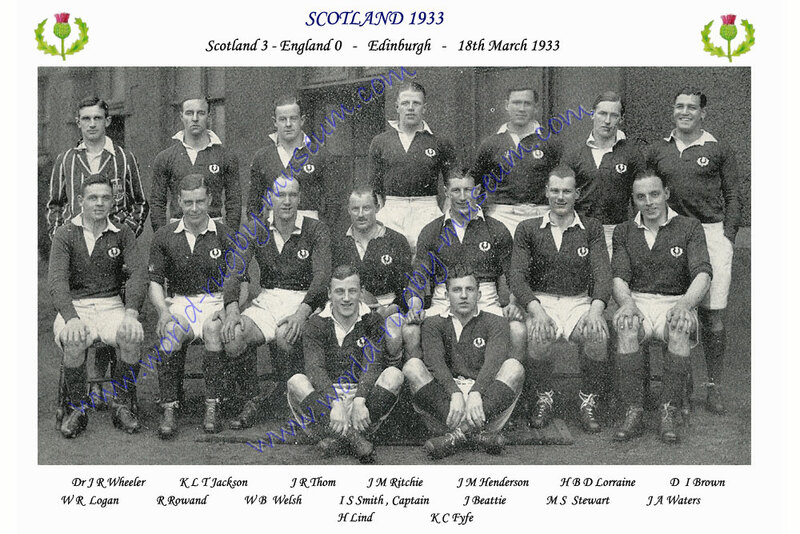 Scotland 1937 - A postcard of the Scottish team that played England on 20th March 1937. The players are named. 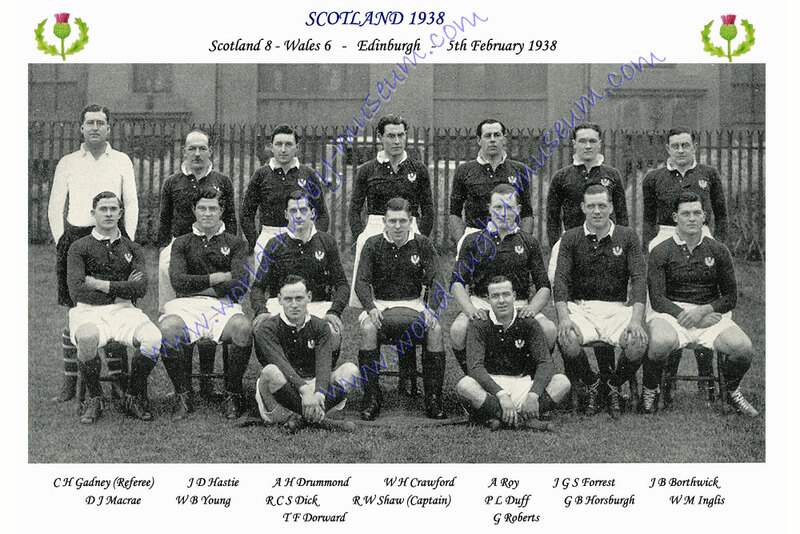 Scotland 1937 - A postcard of the Scottish team that played Wales on 6th February 1937. The players are named. 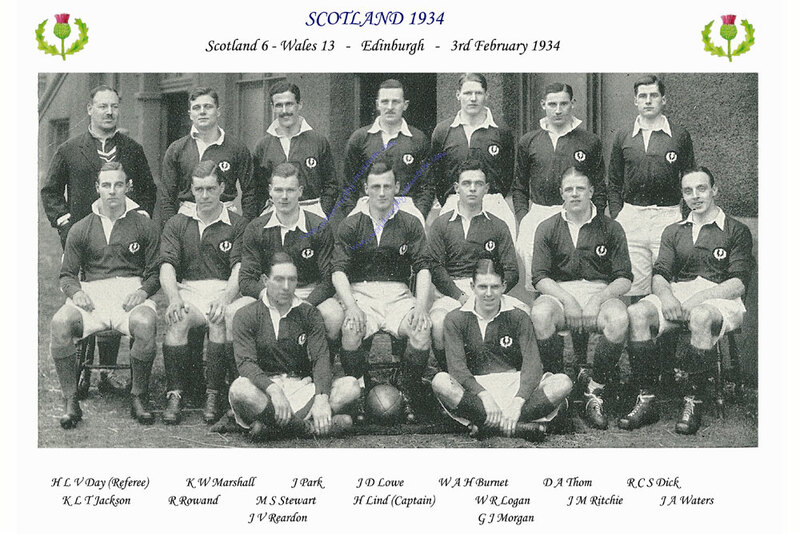 Scotland 1938 - A postcard of the Scottish team that played Wales on 5th February 1938. The players are named. 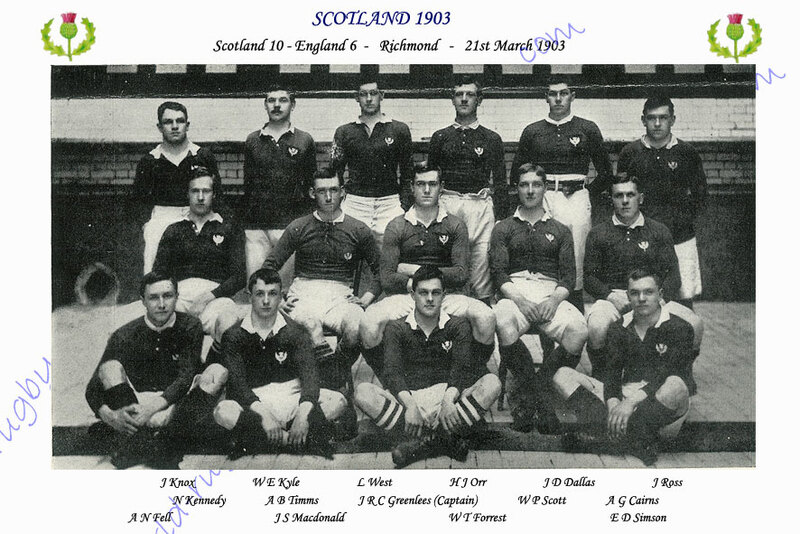 Scotland 1939 - A postcard of the Scottish team that played Ireland on 25th February 1939. The players are named. 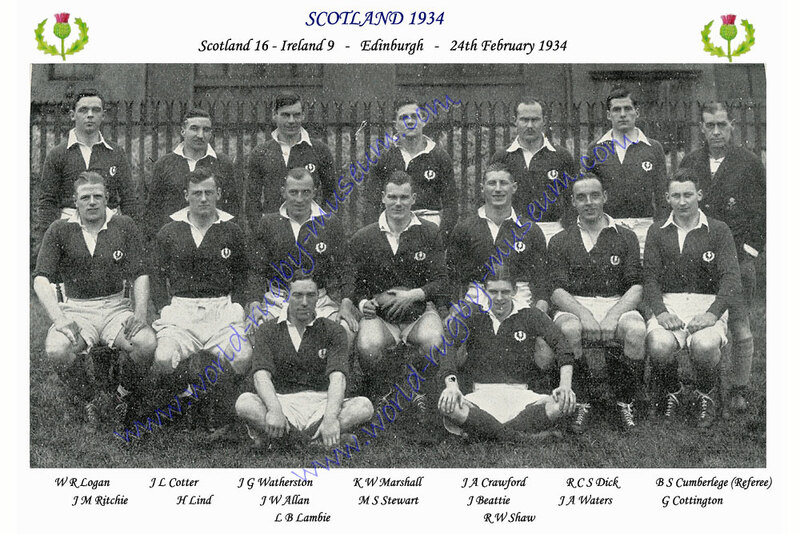 Scotland 1946 - A postcard of the Scottish team that played Ireland on 23rd February 1946. The players are named. 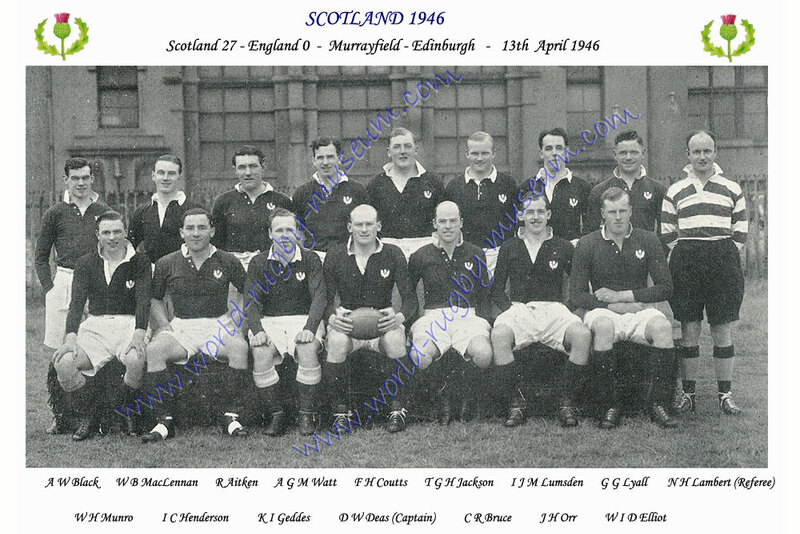 Scotland 1946 - A postcard of the Scottish team that played England on 13th April 1946. The players are named. 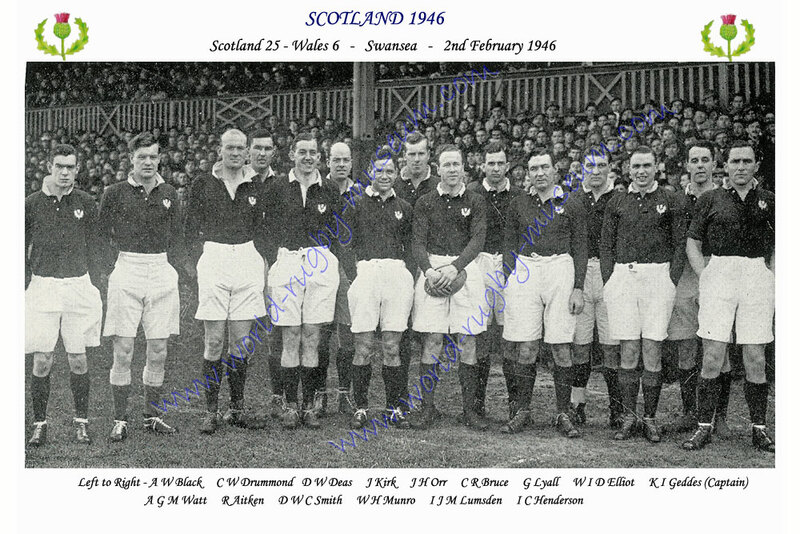 Scotland 1946 - A postcard of the Scottish team that played Wales on 2nd February 1946. The players are named. 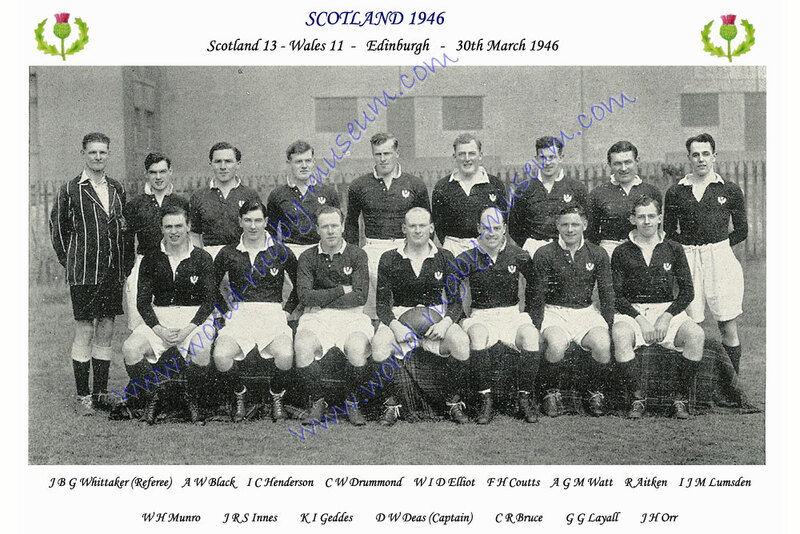 Scotland 1946 - A postcard of the Scottish team that played Wales on 30th March 1946. The players are named. 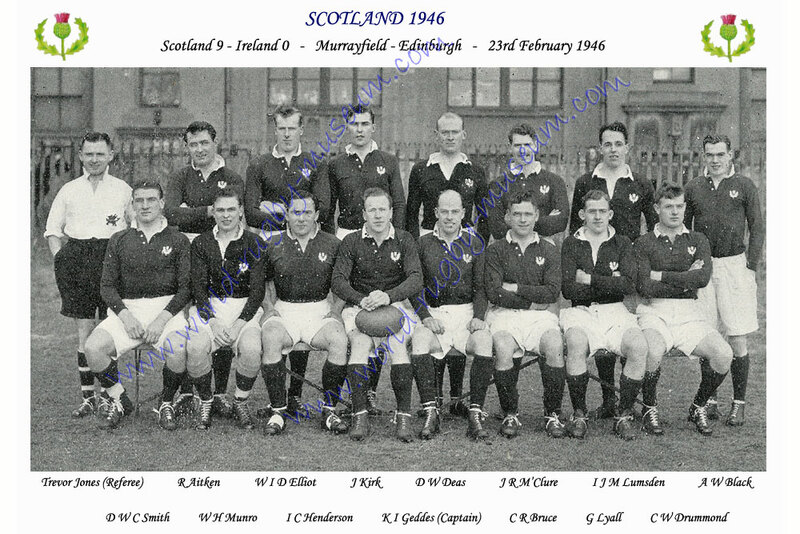 Scotland 1947 - A postcard of the Scottish team that played France on 1st January 1947. The players are named. 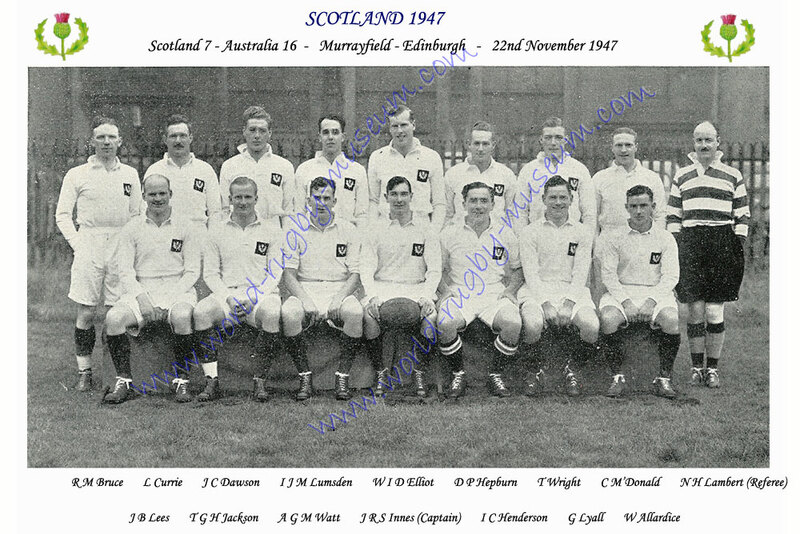 Scotland 1947 - A postcard of the Scottish team that played Australia on 22nd November 1947. The players are named. 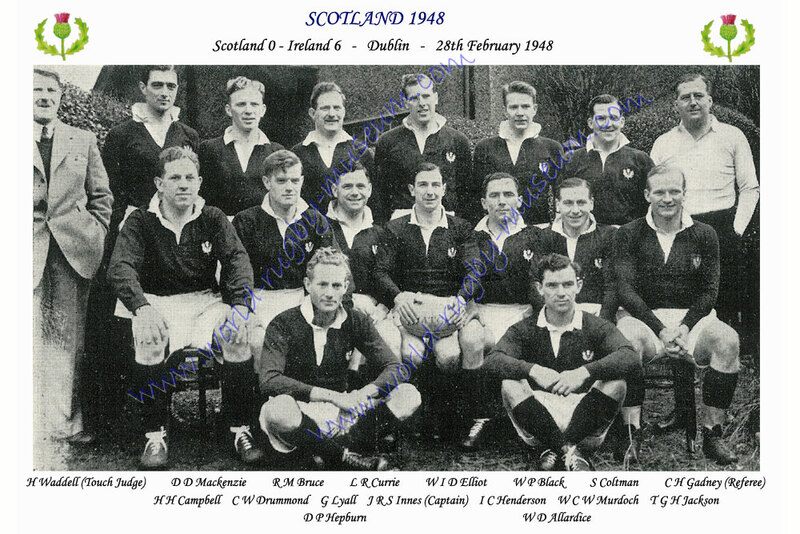 Scotland 1948 - A postcard of the Scottish team that played Ireland on 28th February 1948. The players are named. 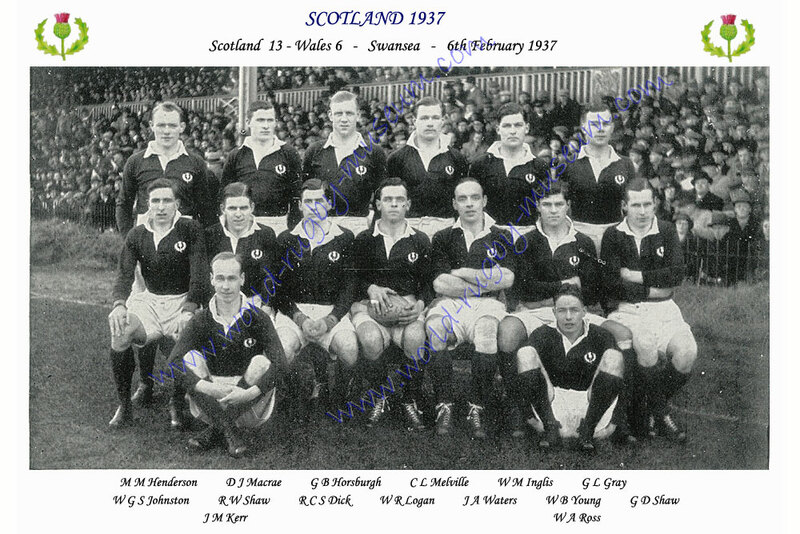 Scotland 1948 - A postcard of the Scottish team that played Wales on 7th February 1948. The players are named. 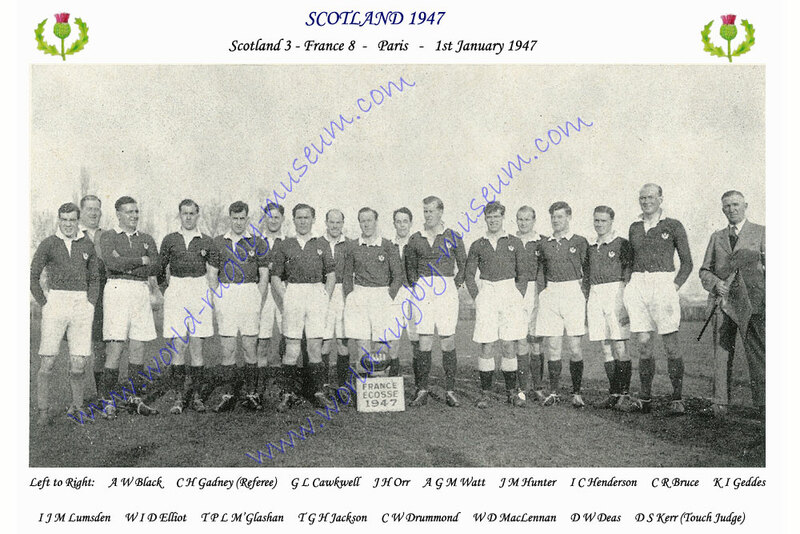 Scotland 1949 - A postcard of the Scottish team that played France on 15th January 1949. The players are named. 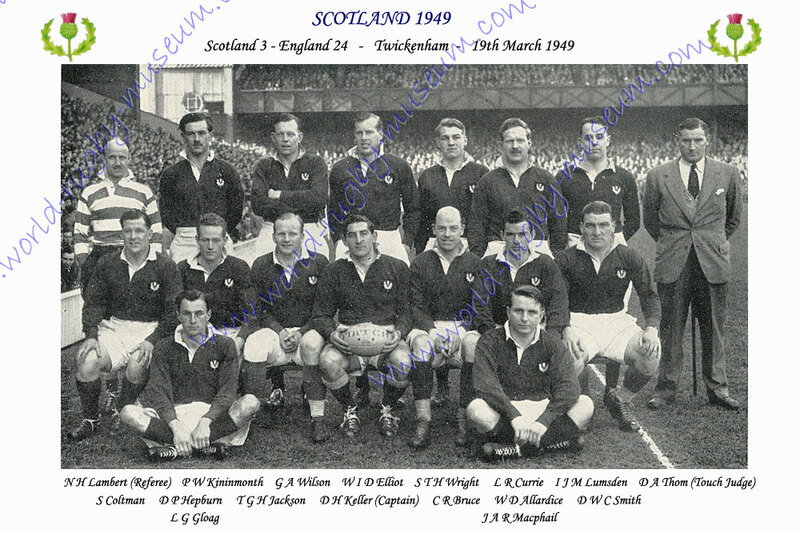 Scotland 1949 - A postcard of the Scottish team that played England on 19th March 1949. The players are named. 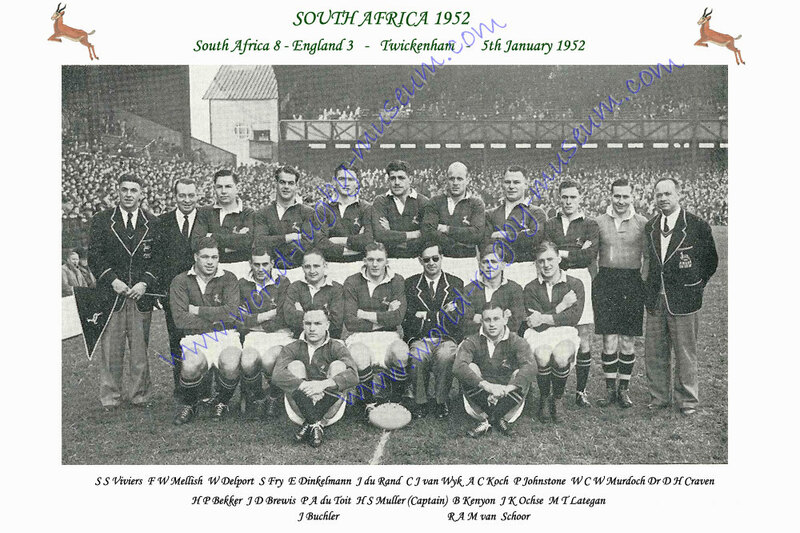 South Africa 1952 - A postcard of the South African team that played England in 1952. The players are named. 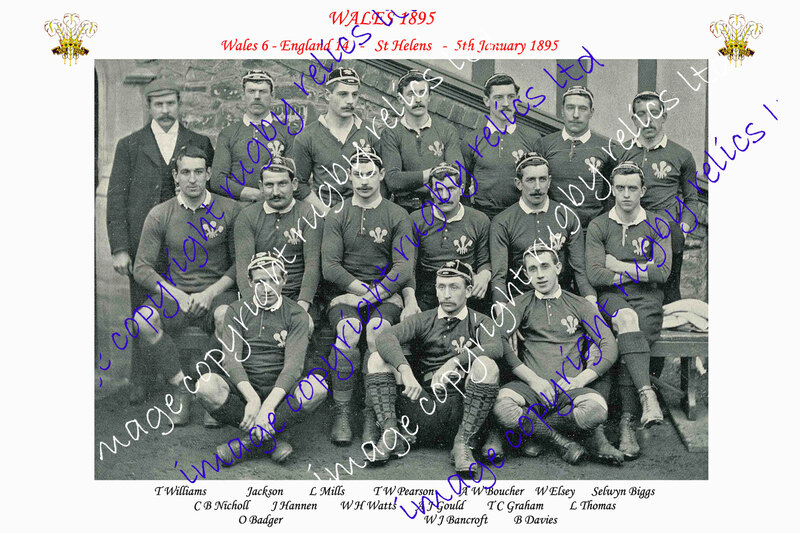 Wales - A postcard Welsh team that played England on 5 January 1895. The players are named. 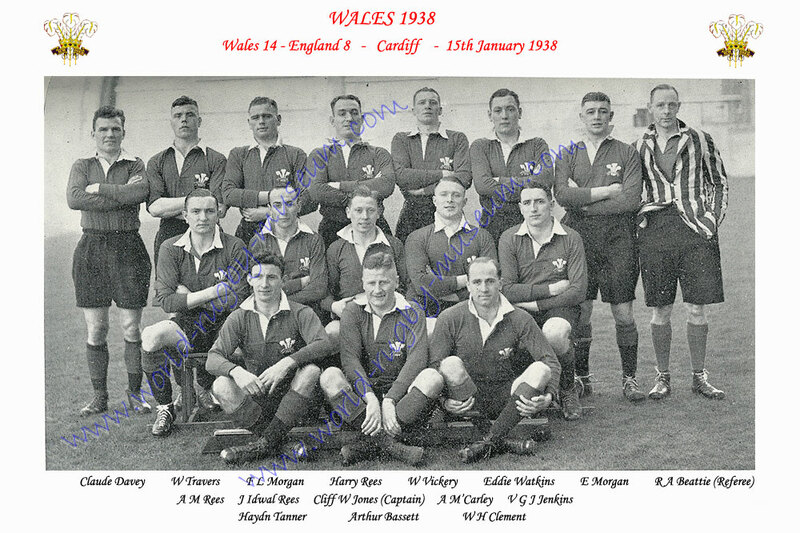 Wales 1934 - A postcard of the Welsh team that played England on 20th January 1934. The players are named. 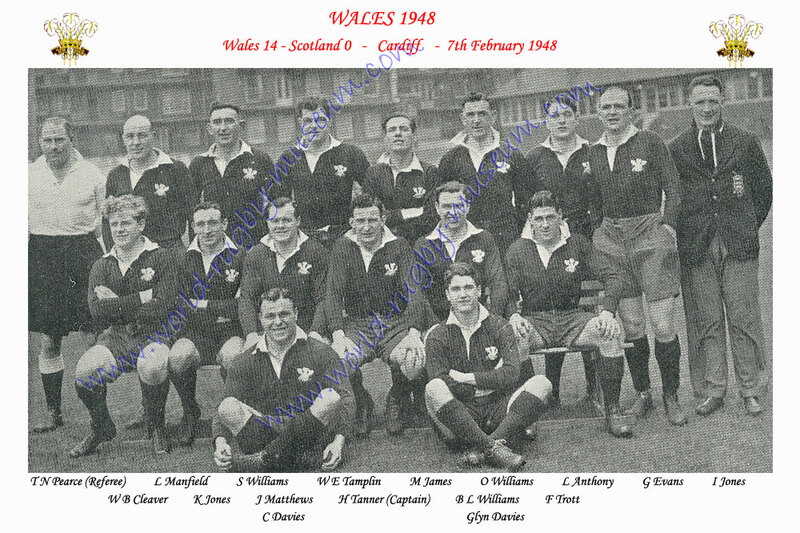 Wales 1946 - A postcard of the Welsh team that played Scotland on 2nd February 1946. The players are named. 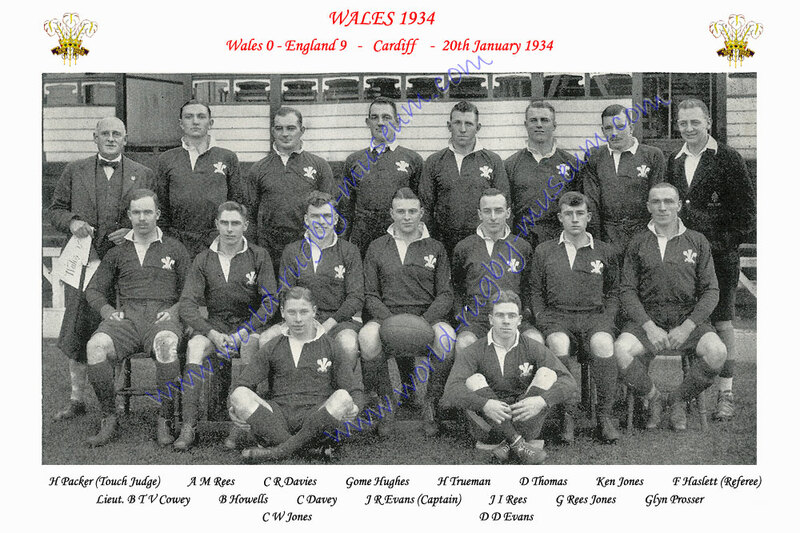 Wales 1938 - A postcard of the Welsh team that played England on 15th January 1938. The players are named. 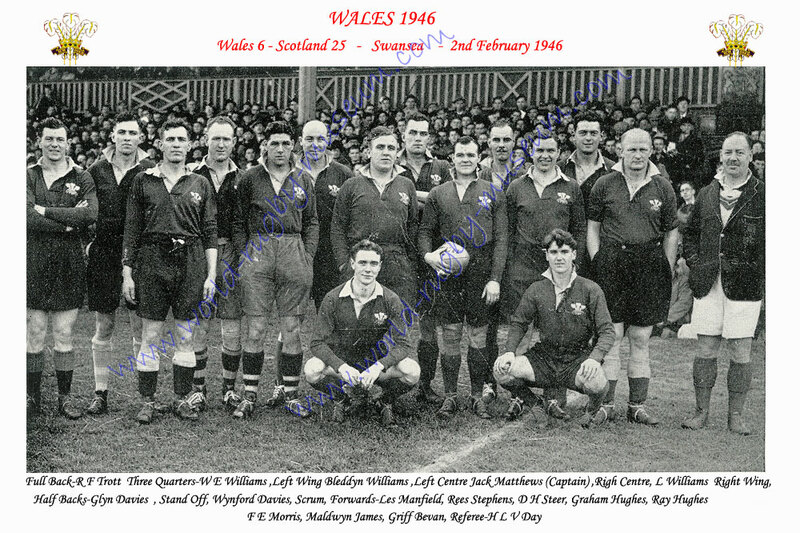 Wales 1948 - A postcard of the Welsh team that played Scotland on 7th February 1948. The players are named. 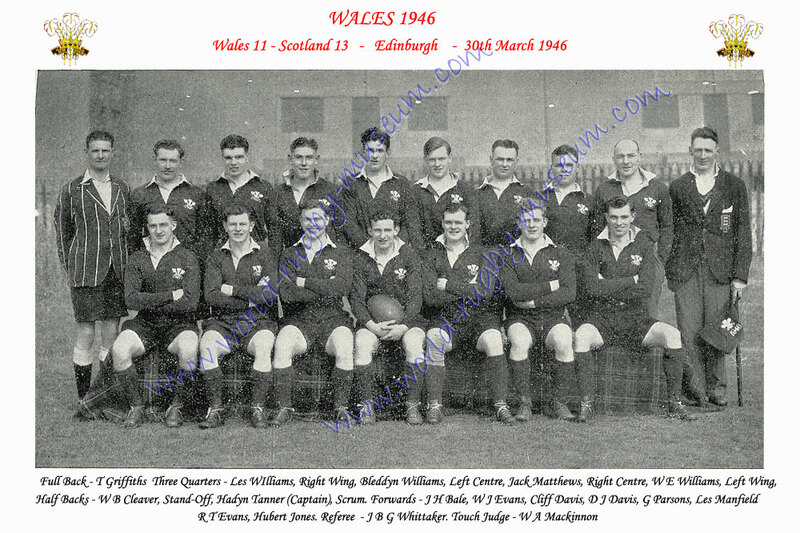 Wales 1946 - A postcard of the Welsh team that played Scotland on 30th March 1946. The players are named. 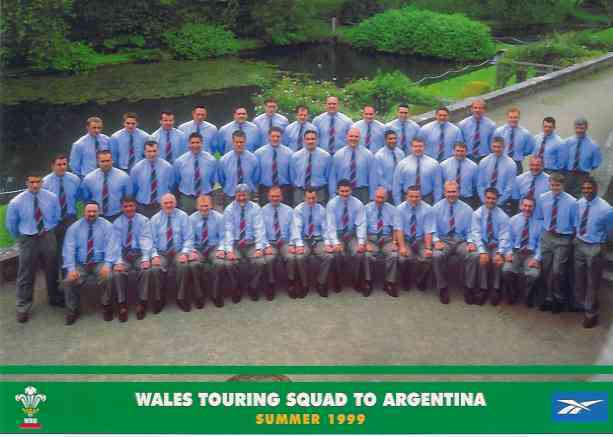 Wales 1997 - A Large Postcard of the Welsh Team that played France, 5 Nations Championship 1997. 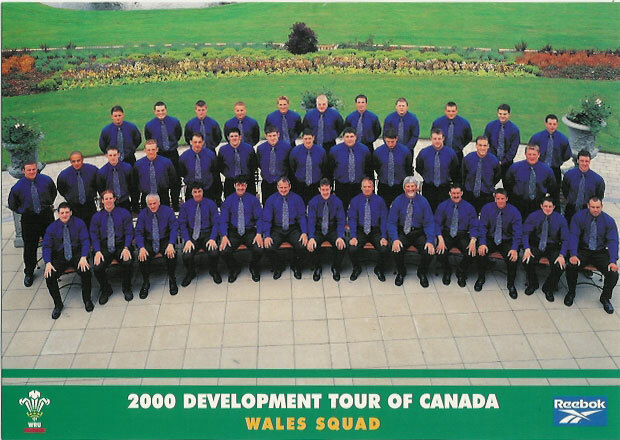 Wales 1998 - Large WRU postcard, pictures the Welsh Development squad that toured Canada in 1998. 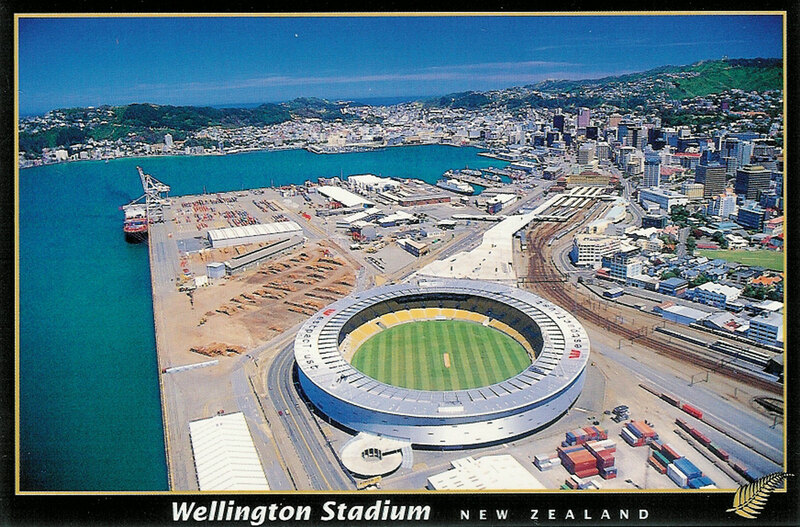 Postally unused, excellent condition. 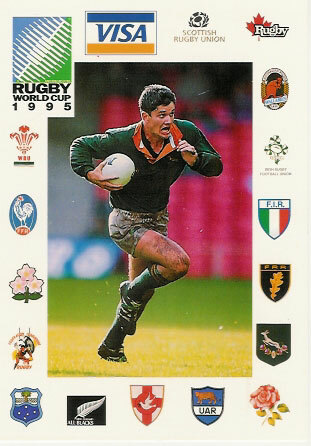 GB postcard published by Rugby Relics, an illustration of John Bevan. Postally unused, excellent condition. 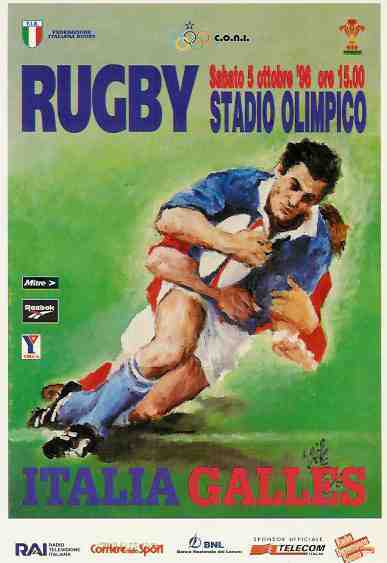 Serge Blanco - holding a golden ball, a card published in France by an unknown publisher. 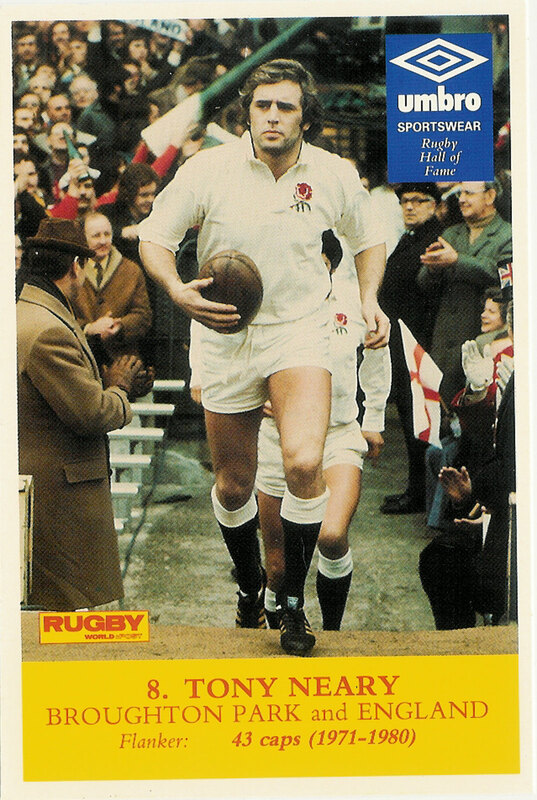 Dusty Hare - Fullback for Nottingham RFC, Leicester Tigers RFC and England, published by J/V Postcards, career information also included on card. 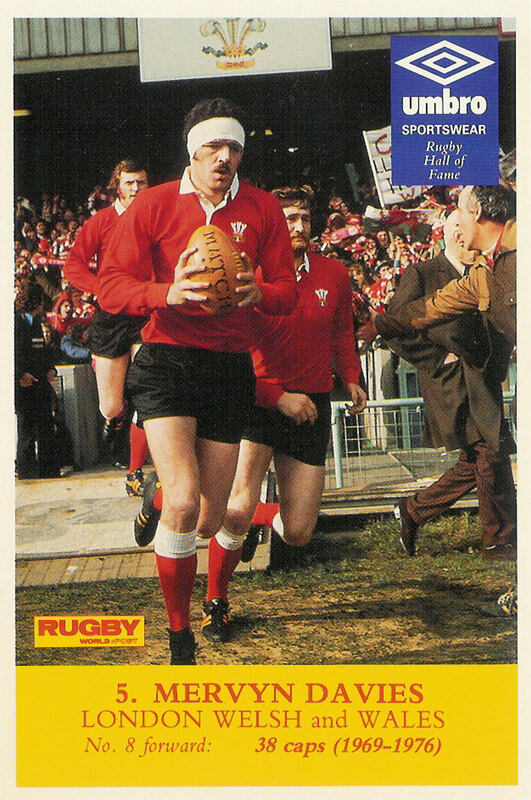 JBG Thomas, Welsh journalist and author. 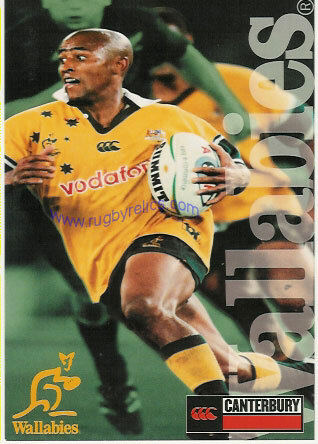 George Gregan, Wallabies - published by Museum of Contemporary Art, Sydney. 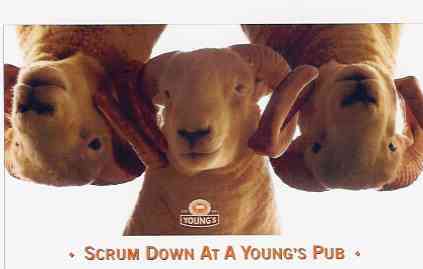 Scrum Down at a Young's Pub - competition card to win an England Rugby Ball, unusual. 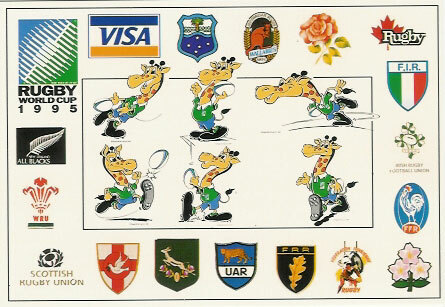 Rugby World Cup 1991 - a postcard published by the Rugby Philatelic Society, this card features Rugby (Town & Union) postmarks through the ages, nicely illustrated. 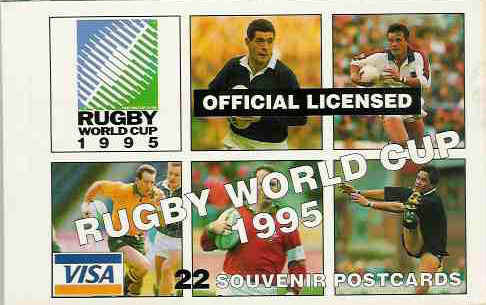 On the reverse a "Rugby World Cup Relay Launch" cachet has been added. 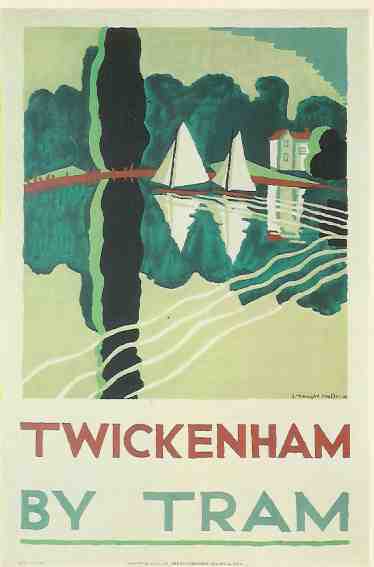 London Transport Museum collection - "Twickenham by Tram"
RWC 1991 postcard Postally unused, excellent condition. Signed by artist Richard Blake. 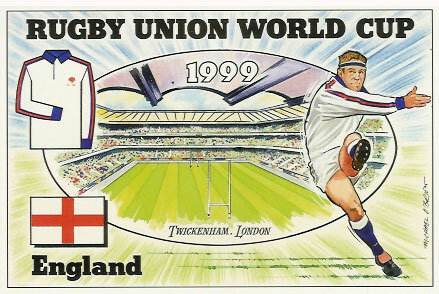 GB postcard, produced by Michael Goldsmith for the Twickenham Postcard and Paper Fair, postcard No 3. Postally unused, excellent condition. 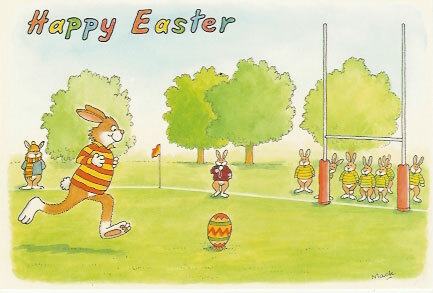 postcard produced by Wildcat Cards, Rugby by Pamela Rhodes. 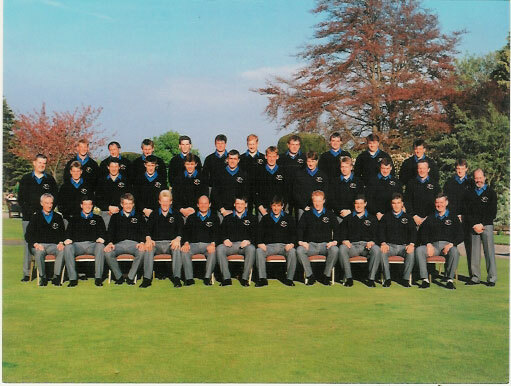 Pictures of Headingley Women's team. Postally unused, excellent condition. 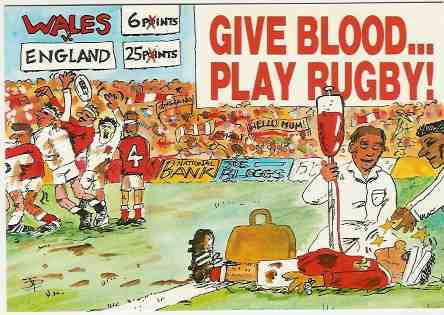 GB postcard, published by P Davies, No 28 of the "Why not try Moderns?" series. 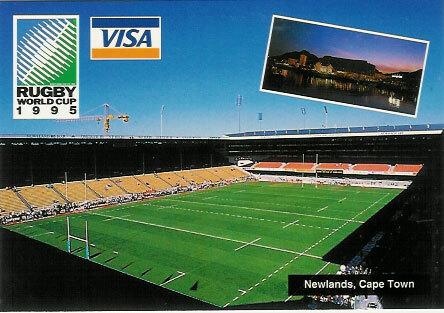 RWC 1991 postcard Postally unused, excellent condition. 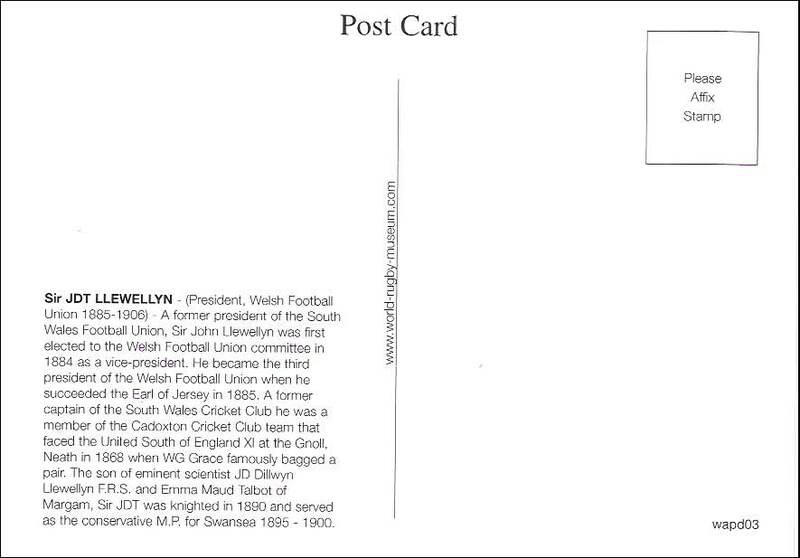 GB postcard, published by Langton Football Collection, "Stevengraph". 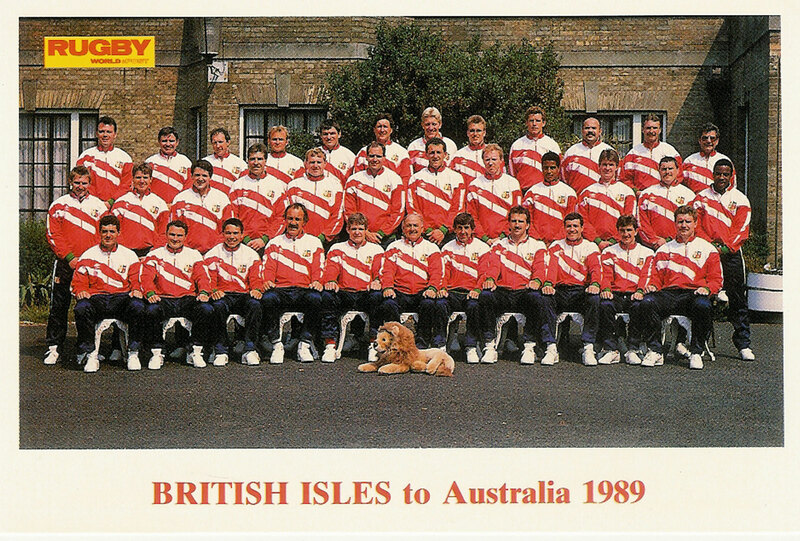 Postally unused, excellent condition. 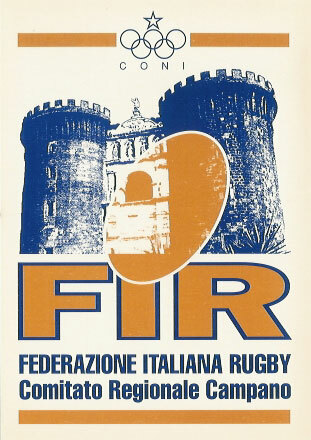 postcard published by The First Event. 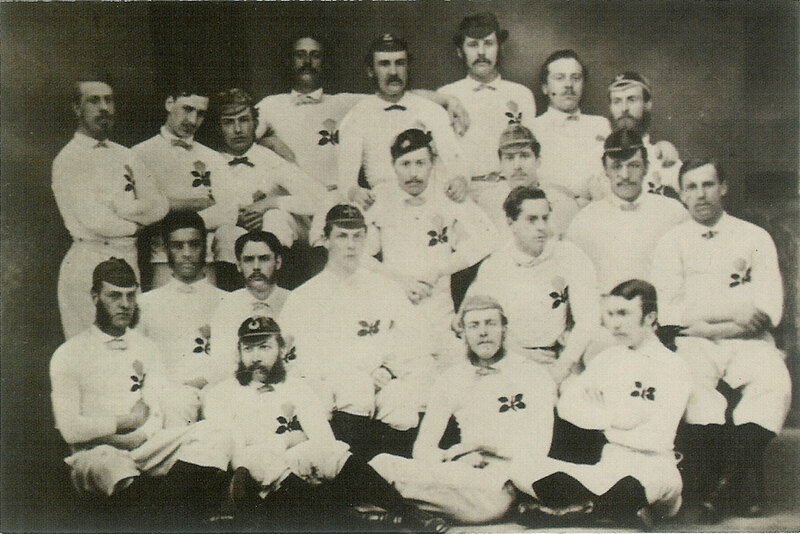 Postcard commemorates the first University rugby match between Oxford and Cambridge 1872. Postally unused, excellent condition. 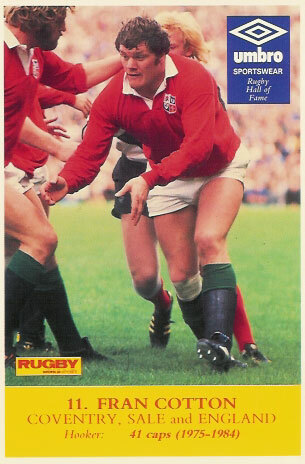 GB postcard, published by Langton Football Collection, "Rugby". Postally unused, excellent condition. 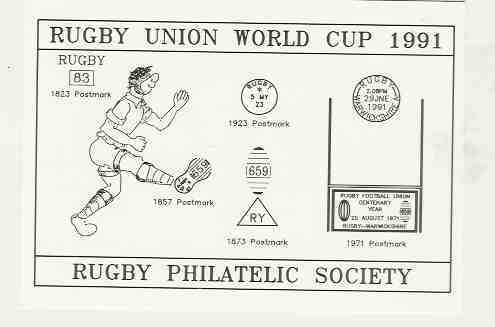 GB postcard produced by the Rugby Philatelic Society of rugby postmarks from 1715 - 1840. Postally unused, excellent condition. 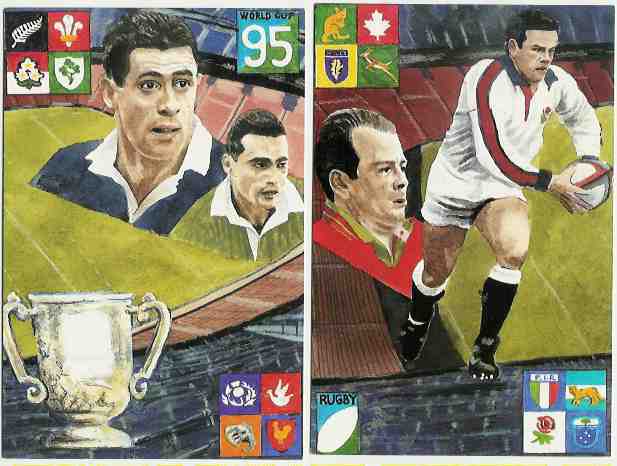 4 postcards published by the Royal Mail PHQ Series, "Sport '91", a set of 4 cards to represent each stamp produced, including one rugby (illustrated). Postally unused, excellent condition. 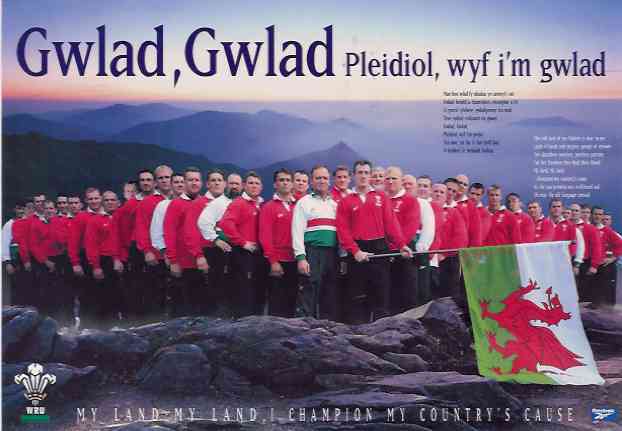 GB postcard, published by P Davies, No 27 of the "Why not try Moderns?" series. 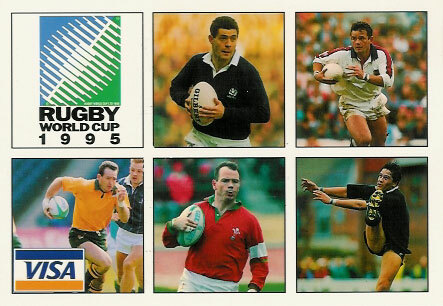 Postcard for the 1991 RWC. Postally unused, excellent condition. 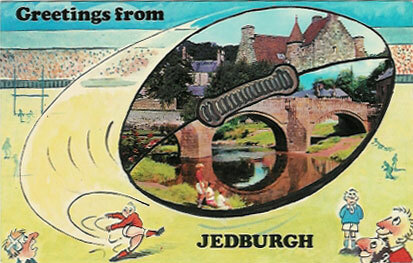 'Greetings from Jedburgh' - Scottish border town, cartoon player kicking a ball with scenes of Jedburgh inside the ball. 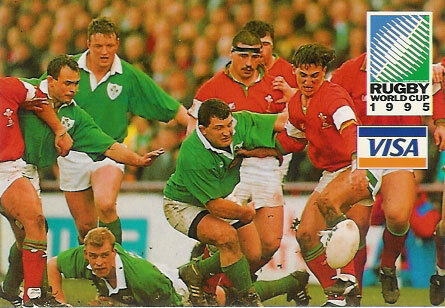 postcard published by the Royal Mail PHQ Series, "Sport '91", this is the rugby card, part of a set of 4. Postally unused, excellent condition. 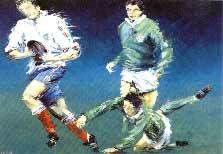 illustration by Gareth Ball of Brian Moore (Harlequins and England). Postally unused, light corner fold. 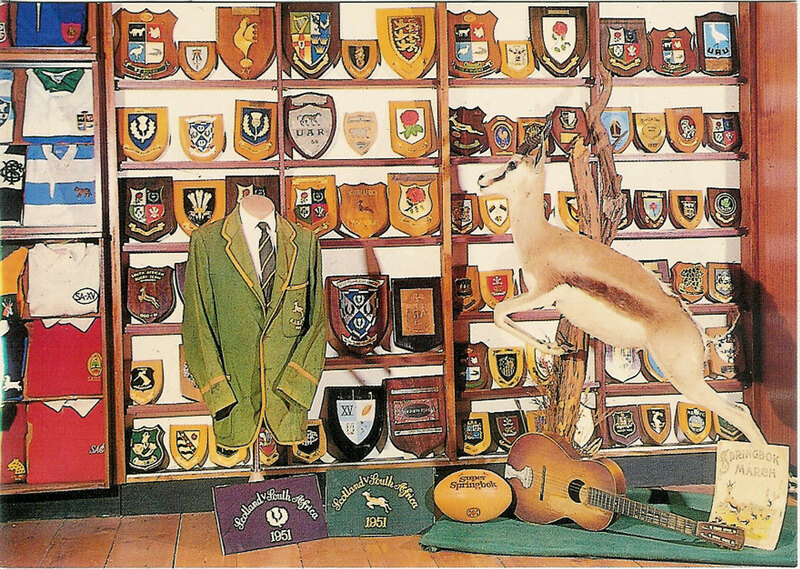 postcard produced by the Warwickshire Heritage Collectors, No 10, The James Gilbert Rugby Football Museum. Postally unused, excellent condition. 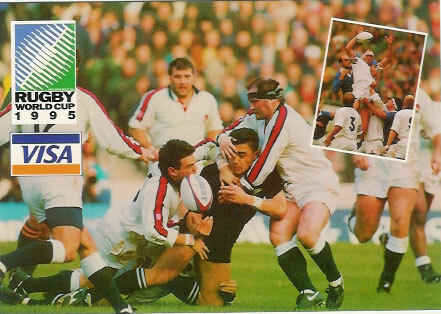 England - RWC 1999, card No 4 of a set of 20 cards published by Brian Lund Postcards unused, excellent condition. 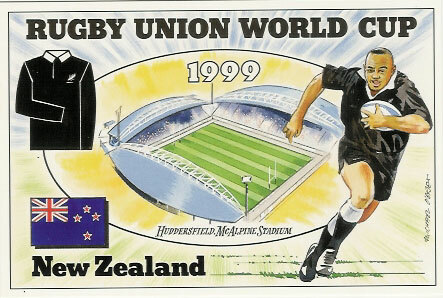 New Zealand - RWC 1999, card No 11 of a set of 20 cards published by Brian Lund Postcards unused, excellent condition. 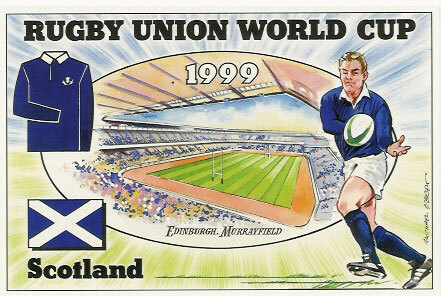 Scotland - RWC 1999, card No 14 of a set of 20 cards published by Brian Lund Postcards unused, excellent condition. 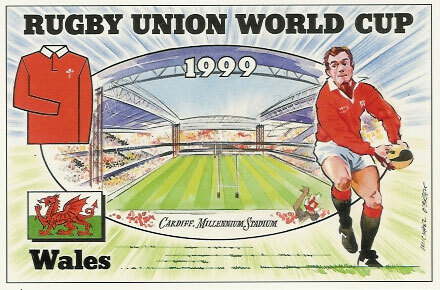 Wales - RWC 1999, card No 19 of a set of 20 cards published by Brian Lund Postcards unused, excellent condition. 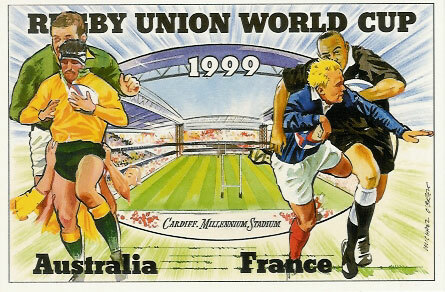 Australia v France - RWC 1999 Final, an additional card to the 20 postcard set published by Brian Lund Postcards unused, excellent condition. 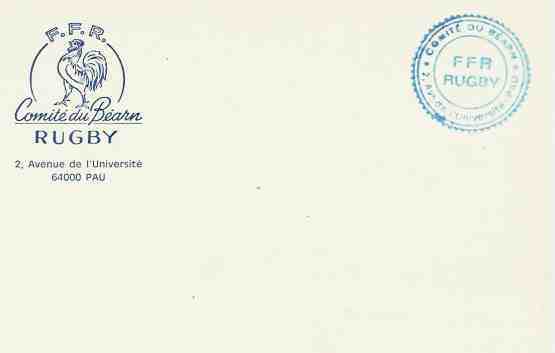 Comite du Bearn, FFR printed p/card with comite rubber stamp to upper right hand corner. 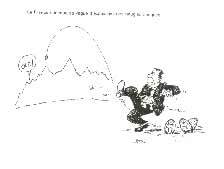 Unknown publisher - French b&w cartoon postcard, caption says "Ils ont besoin d'aide?.." Postally unused, excellent condition. 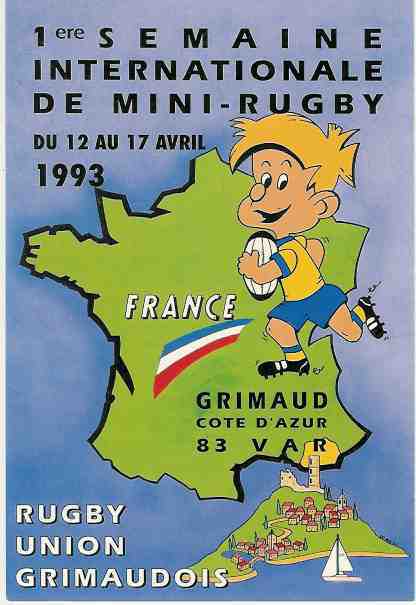 Unknown publisher - French postcard dated 25/10/91. Pictures a Lion saying "Shocking le Froggy" above French text. Postally unused, excellent condition. 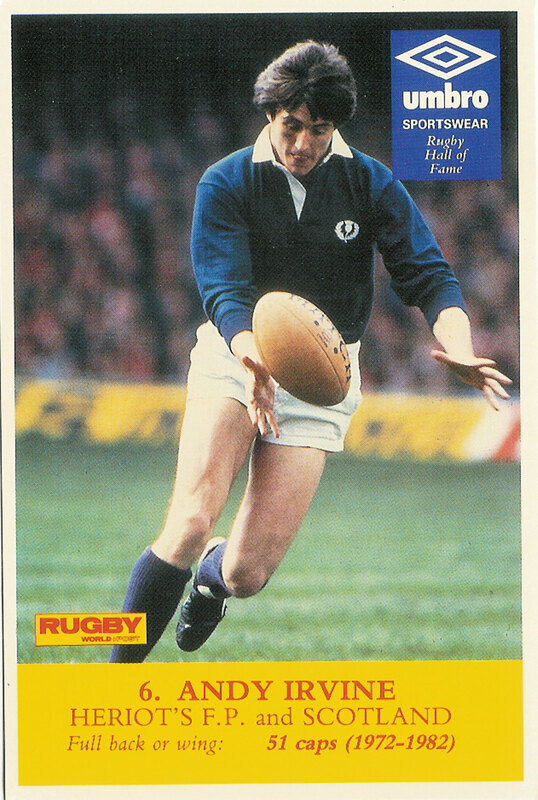 Unknown publisher - French postcard dated 19/1/91, France v Scotland 1990 match is mentioned in the text. Postally unused, excellent condition. 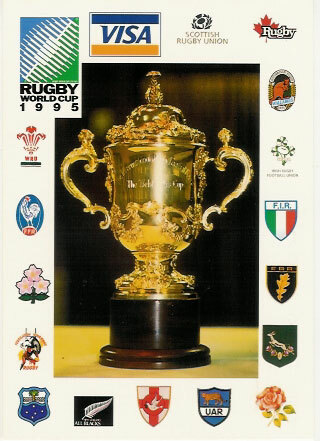 Unknown publisher - French postcard for the 1993 Five Nations tournament. Postally unused, excellent condition. 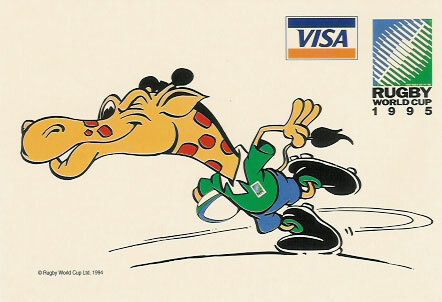 Unknown publisher - French postcard of a black and white cartoon of a playing passing a head froma ruck. Postally unused, excellent condition. French postcard by Serge Laget of a b&w illustration with plenty of text, possibly for a philatelic exibition. Used, excellent condition. 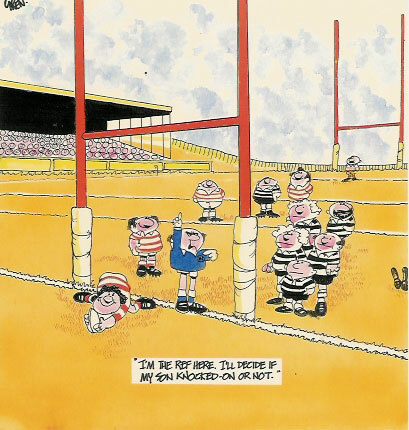 Unknown publisher - French postcard with a b&w catoon illustration of a player at the bottom of a scrum saying "Interdit de me plaquer!". Postally unused, excellent condition. 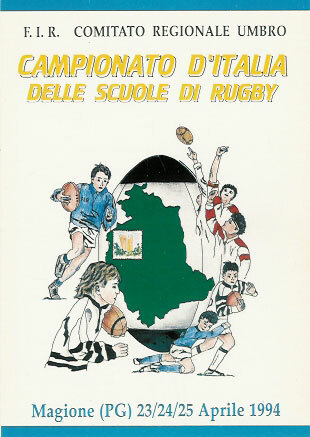 L'Artisie roi, French postcard for Easter, illustration shows a ball wrapped in a ribbon shooting out of a scrum. Postally unused, excellent condition. 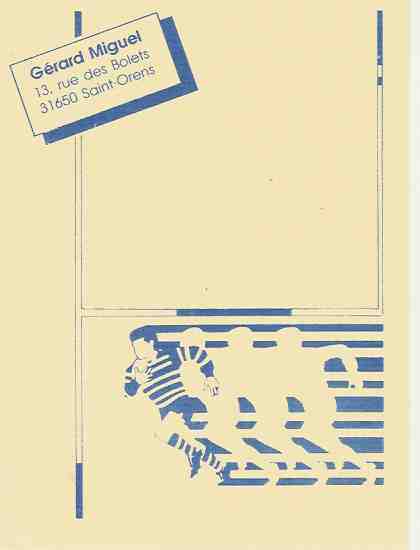 postcard by Editions Dutilleul - 'French break' designed by Esteve. Postally unused, excellent condition. Midi Pyrenees Philatelists postcard, Jean Gerard Miguel. 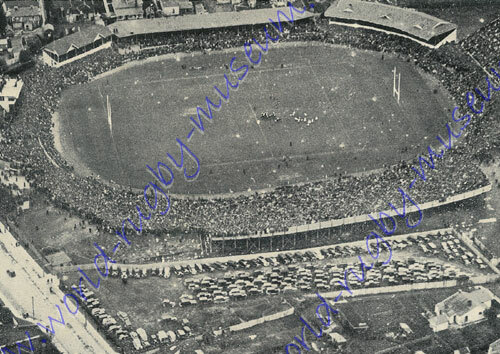 Postally unused, slight crease on top left corner. 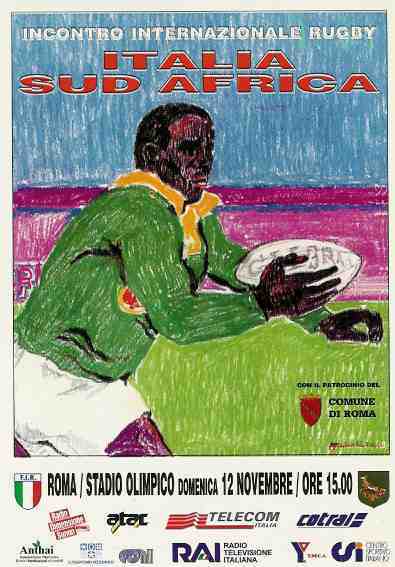 French postcard, "L'Artiste Roi", for the 1993 Five Nations Tournament. Postally unused, excellent condition. 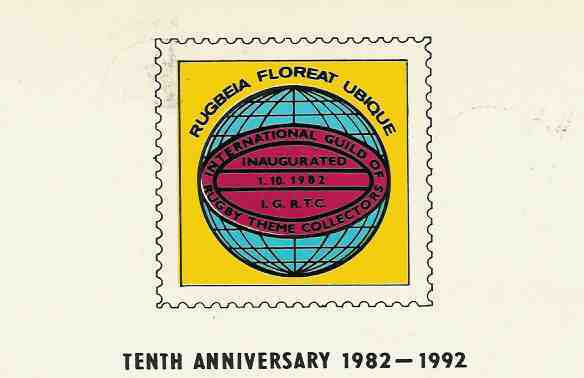 French maxi card, printed handstamp for the Toulouse centenary on the front of a Toulouse centenary postcard, dated 20/12/1990. Excellent condition. 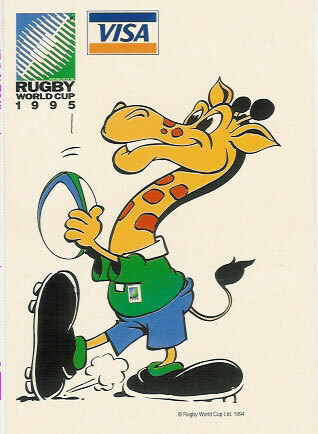 Unknown publisher - French postcard for the Peugeot Open 1991. 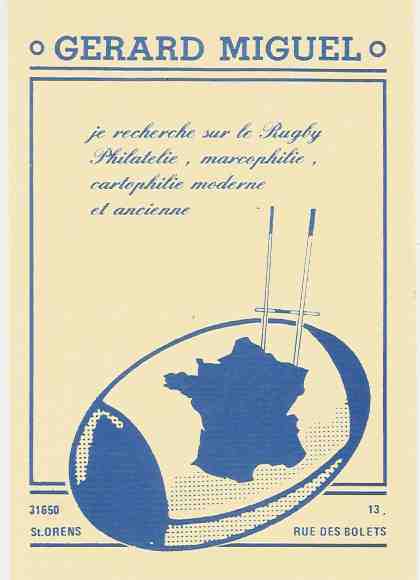 Illustration shows a golfer dropping ball and a rugby player waving, with the caption "Ne confondons pas! Faire un drop et dropper la balle!". Postally unused, excellent condition. 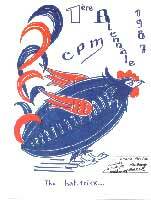 postcard by Jacques Lardie, Hommage a R. Couderg, limited edition of 100. Postally unused, excellent condition. 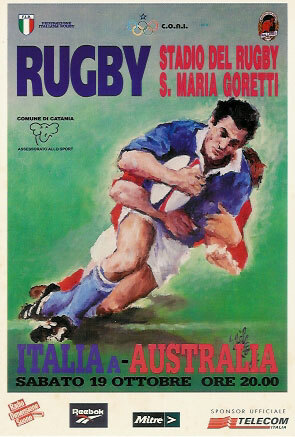 Italy A v Australia match advertising postcard 19/10/96. Postally unused, excellent condition. 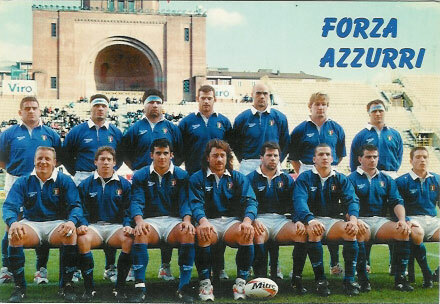 Italy v Wales 1996 match advertising postcard - illustration of players. 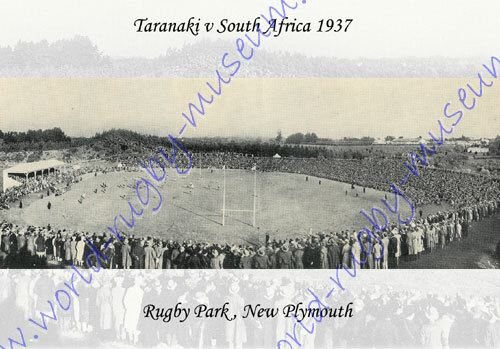 New Zealand postcard published by Pictorial Postcards , 'Sport in New Zealand' includes a rugby picture. Postally unused, excellent condition. No 1. 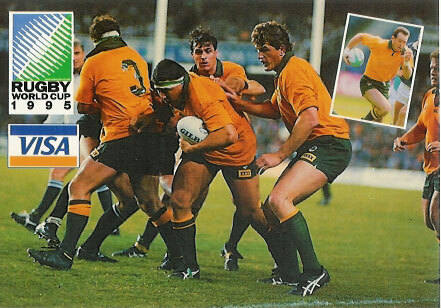 NZ v Australia 1985. Postally unused, excellent condition. 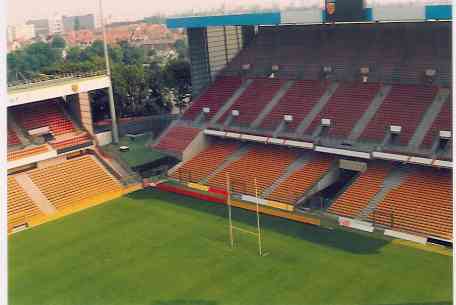 No 2. 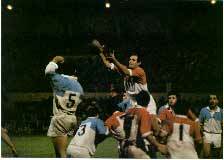 NZ v Lions 2nd Test 1983. Postally unused, excellent condition. 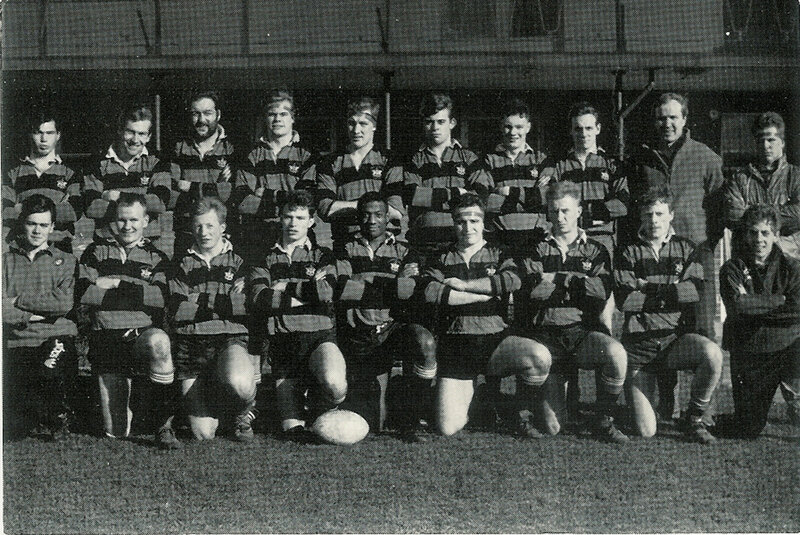 No 3. 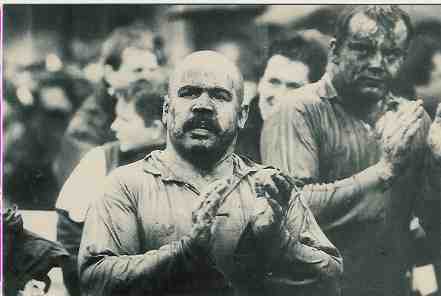 NZ v Springboks 1st Test 1981. Postally unused, excellent condition. 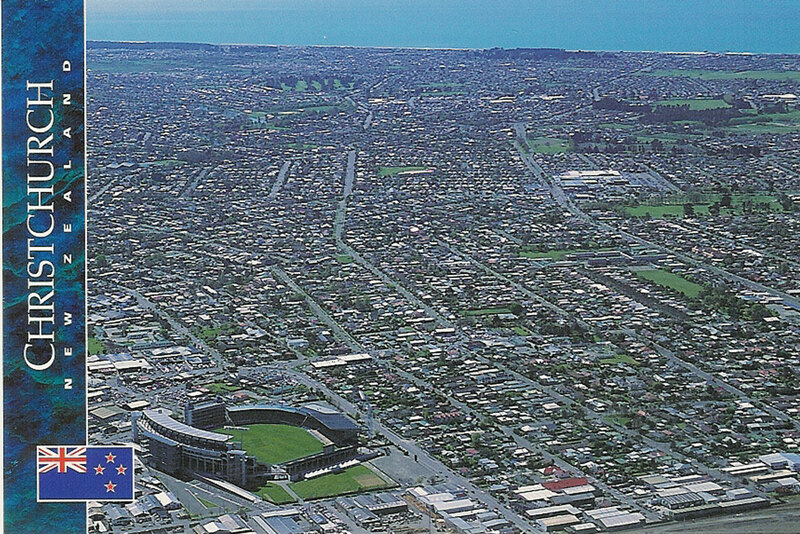 No 4. 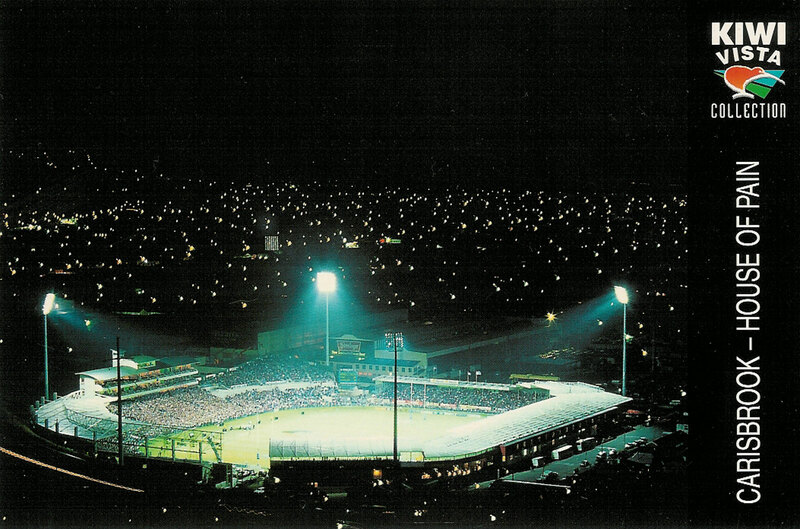 NZ v England 1985. Postally unused, excellent condition. 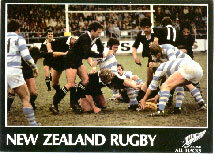 No 5 NZ v Argentina 1st Test 1979. Postally unused, excellent condition. 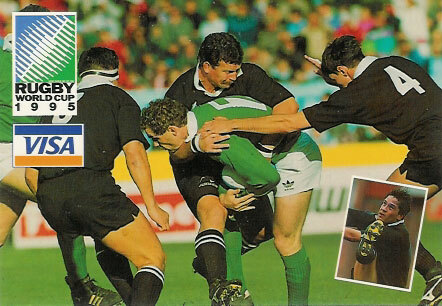 OUT OF STOCK No 6 NZ v France 1986. Postally unused, excellent condition. 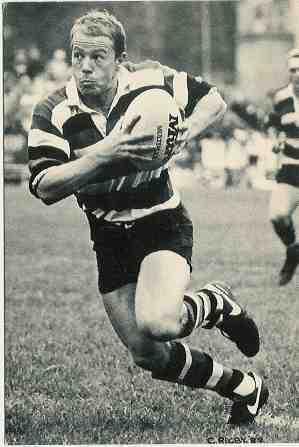 No 7 Fiji v NZ 1984. Postally unused, excellent condition. 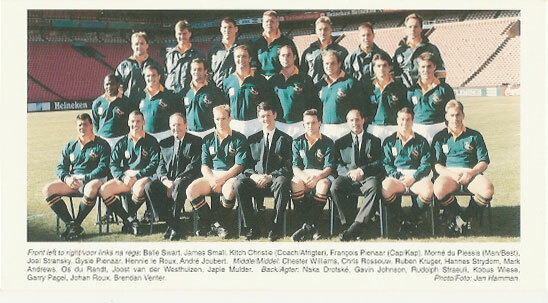 South African Rugby Museum, Cape Town, unused, excellent condition. 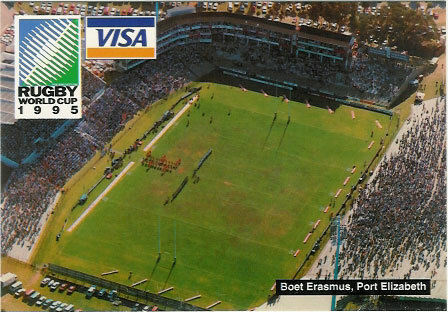 South African Maxi Card produced by Table Bay Printers to commemorate sport in South Africa, rugby stamp which has the same illustration as the postcard, for the Western Province centenary. Postally unused, excellent condition. 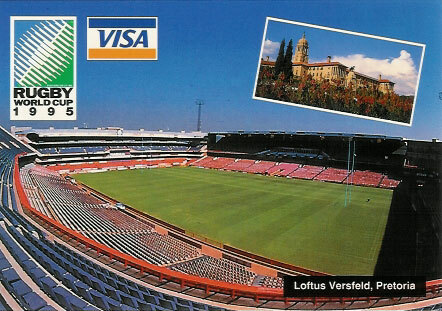 SPECIAL OFFER - A group of 17 postcards published by Procard in South Africa for the 1995 Rugby World Cup, the cards comprise of the complete set of 22 apart from the 5 postcards of the Stadia pictured above (Boet Erasmus, Ellis Park, King's Park, Newlands & Loftus Versfeld), postcards include players, mascot illustrations, a nice group of cards in mint condition. A Bettmann Archive Nostalgicard, Princeton , illustrated by HG Laskey. 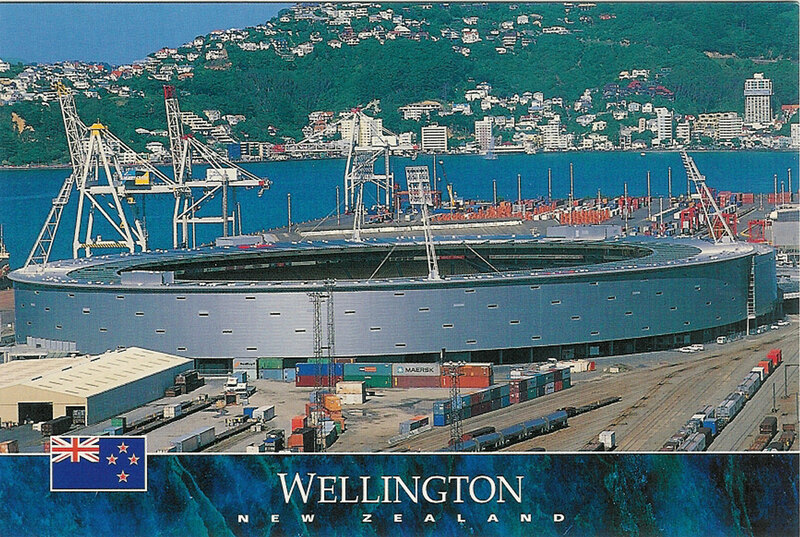 Postally unused, excellent condition. 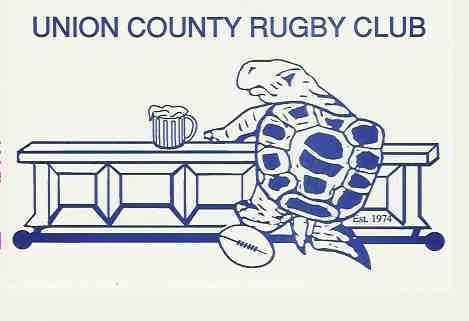 Union County Rugby Club - USA. 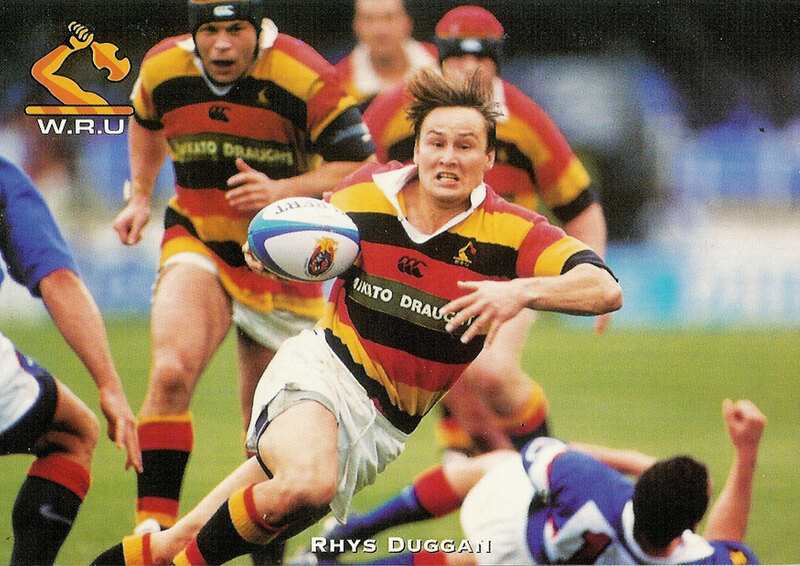 Unused card for club in Division 1 - N.Y. Metropolitan Rugby Union. 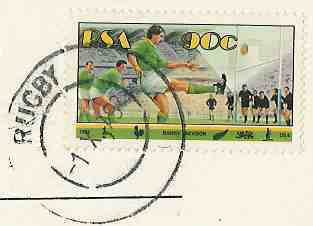 USA postcard produced by Matt Godek "A Game of Foot-Ball", large postcard, postaly unused, excellent condition. 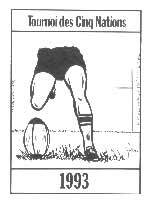 USA postcard produced by Matt Godek, illustration from Harper's Weekly 5/2/1870, "Foot-Ball at Rugby". Postaly unused, excellent condition. 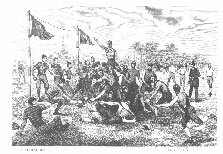 USA large postcard produced by M Godek, illustration from Harper's Weekly 15/7/1865, "Holiday in camp, soldiers playing football". 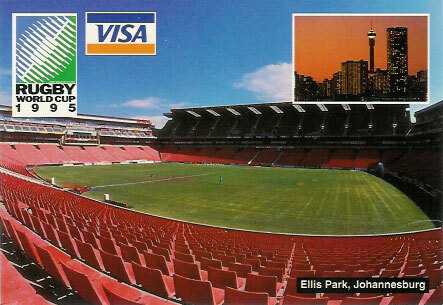 Postaly unused, excellent condition. 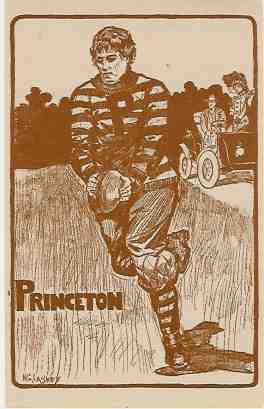 USA large postcard produced by M Godek, illustration from Harper's Weekly 4/12/1886, "The Game of Football for the Championship between Yale & Princeton". Postaly unused, excellent condition. 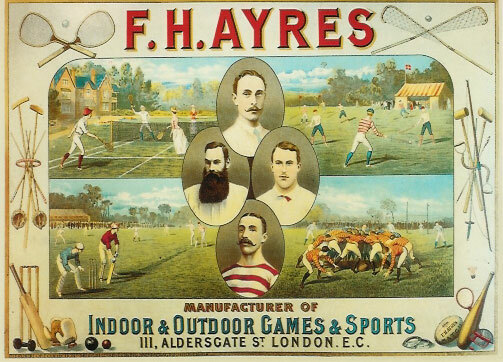 USA large postcard produced by M Godek, illustration from Harper's Weekly 16/11/1889, "An English Foot-Ball match". Postaly unused, excellent condition. USA large postcard produced by M Godek, illustration from Harper's Weekly 5/11/1881, "A Game of Foot-Ball, a scrummage at the close". Postaly unused, excellent condition. 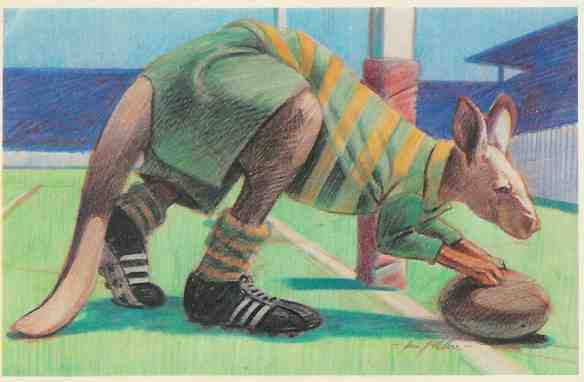 USA large postcard produced by M Godek, illustration from Harper's Weekly, "A Match at Foot-Ball, the last scrummage". Postaly unused, excellent condition. 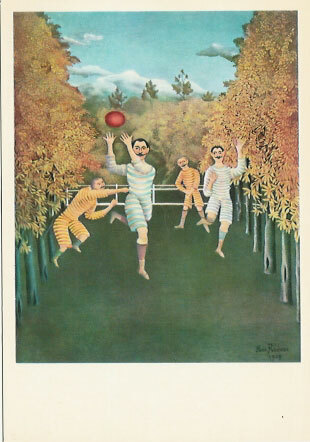 USA large postcard produced by M Godek, illustration from Harper's Weekly 29/11/1890, "Foot-Ball a collision at the ropes". Postaly unused, excellent condition. USA large postcard produced by M Godek, illustration from Harper's Weekly 18/4/1879, Football match between Yale & Princeton. Postaly unused, excellent condition. 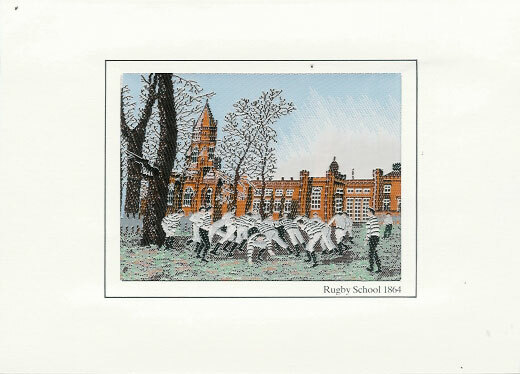 USA large postcard produced by M Godek, illustration from Harper's Weekly 6/6/1891, "Rugby Scholl from the Close". Postaly unused, excellent condition. USA large postcard produced by M Godek, illustration from Harper's Weekly 26/6/1876, "Foot-Ball at the Wall". Postaly unused, excellent condition. 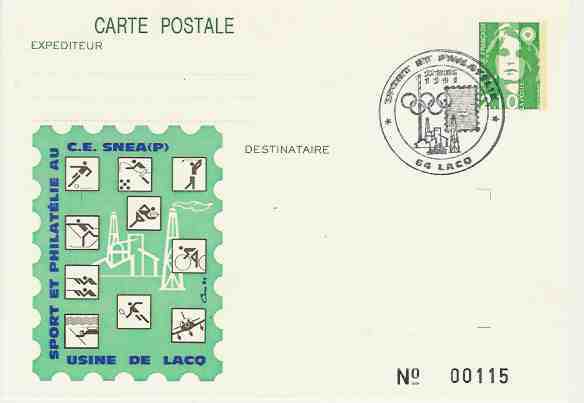 Japanese Maxi Card with a printed handstamp dated 20/10/74 for the 29th National Athletic Meeting on a pre paid postcard. Excellent condition. 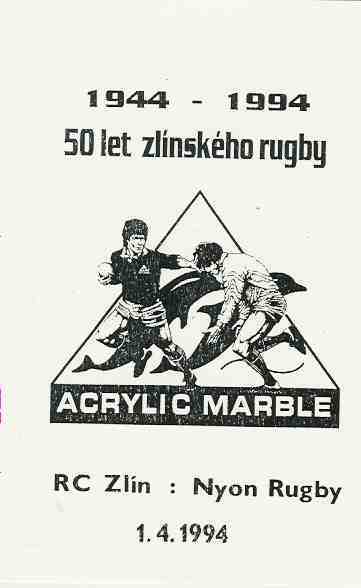 Used mainly for advertising, player handouts or sale at club shops etc. 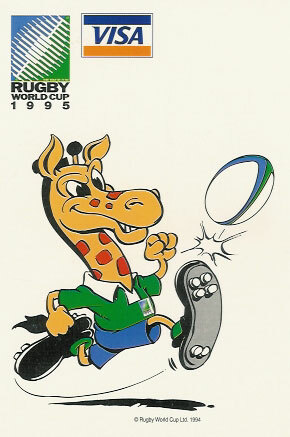 Gren illustration from the 1985 Rugby Addicts calendar. 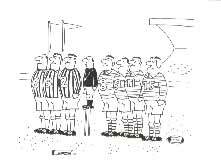 "I'm the Ref here. 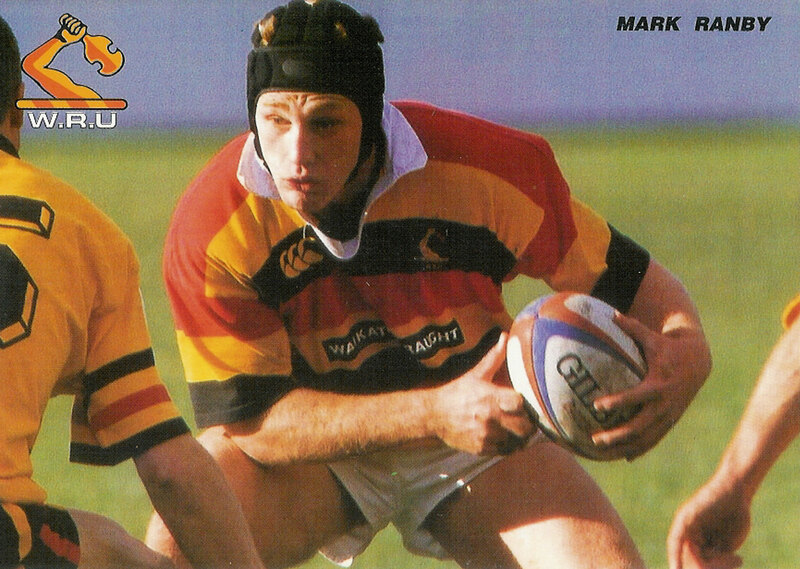 I'll decide if my son knocked-on or not" a printed card from 'Club Rugby' - an Oriel touring exhibition 1985. 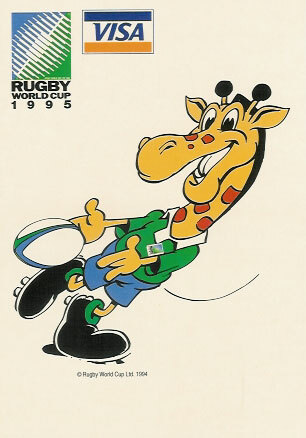 Gren illustration from the 1985 Rugby Addicts calendar. 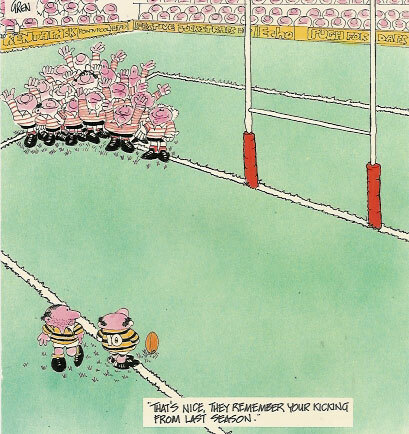 "That's nice, they remember your kicking from last season" a printed card from 'Club Rugby' - an Oriel touring exhibition 1985. 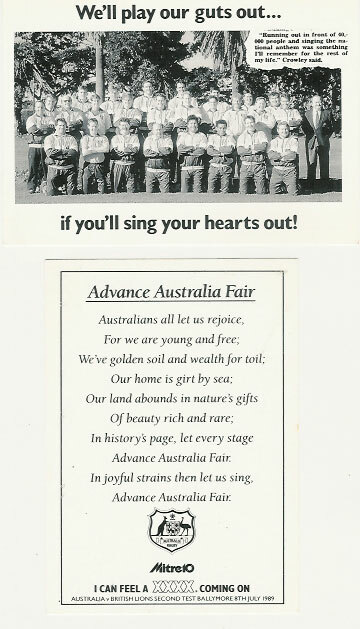 Australia v British Lions 1989, 2nd Test, Ballymore, Australian squad photo to the front, national anthem to the reverse, these cards were printed and distributed to help the Aussie crowds learn the national anthem. 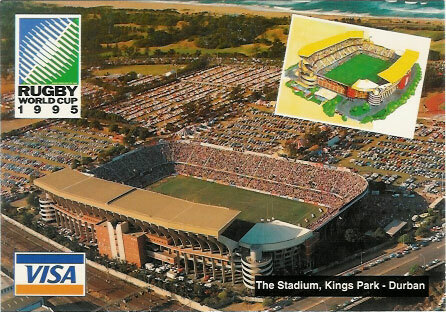 Slightly smaller than postcard size. 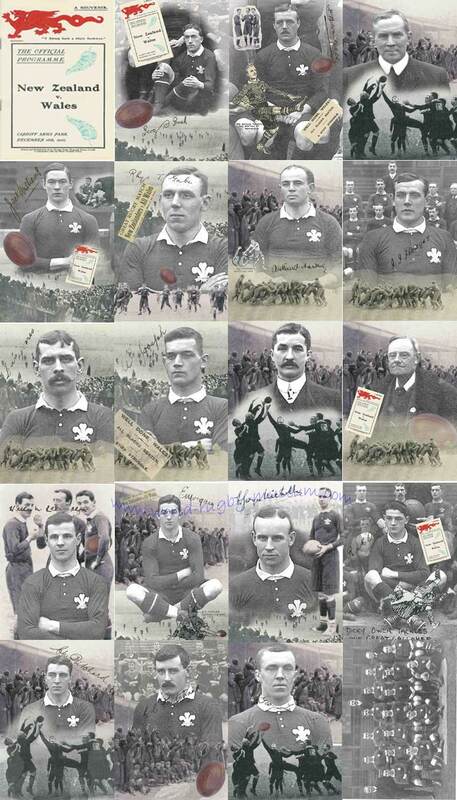 A COLLECTION of 16 PRINTED RUGBY CARDS - A selection of 16 printed cards, all with the subject of rugby union. 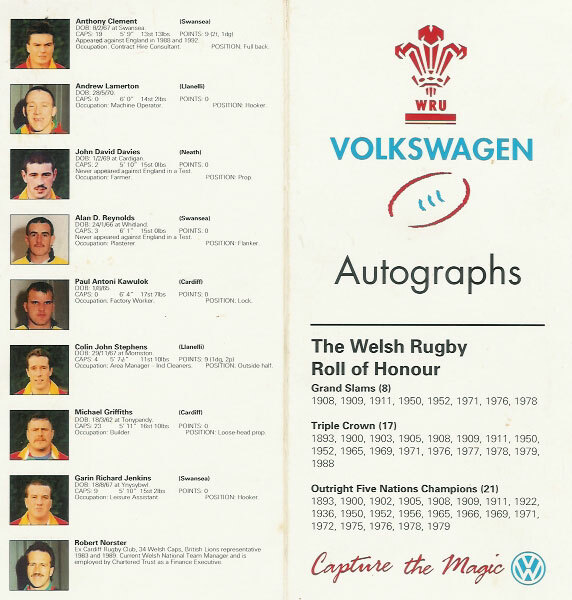 Mostly postcard and large postcard sized cards to include a Brains Welsh team card, Lions book, Steelers, NZ, Eden Park England squad printed card with printed autographs on reverse, France, Llanelli & Scotland card with Peter Dods signature to reverse & 2 x Springbok player Mizuno promo cards. All in very good condition. 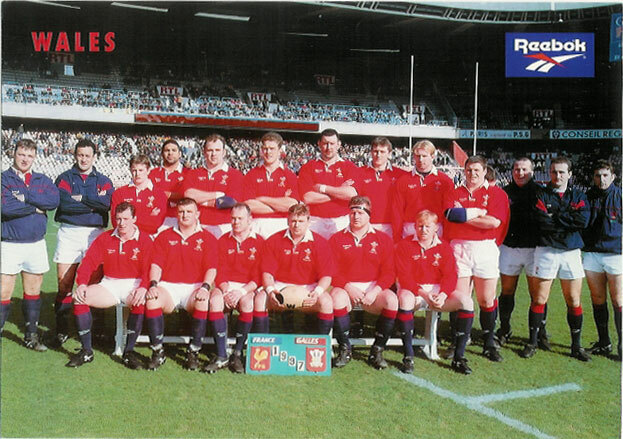 A COLLECTION of 12 PUMA PROMO CARDS, BRITISH & IRISH LIONS 1997 - A collection of 12 Puma printed plain backed promo cards the majority being 1997 Lions in playing kit. 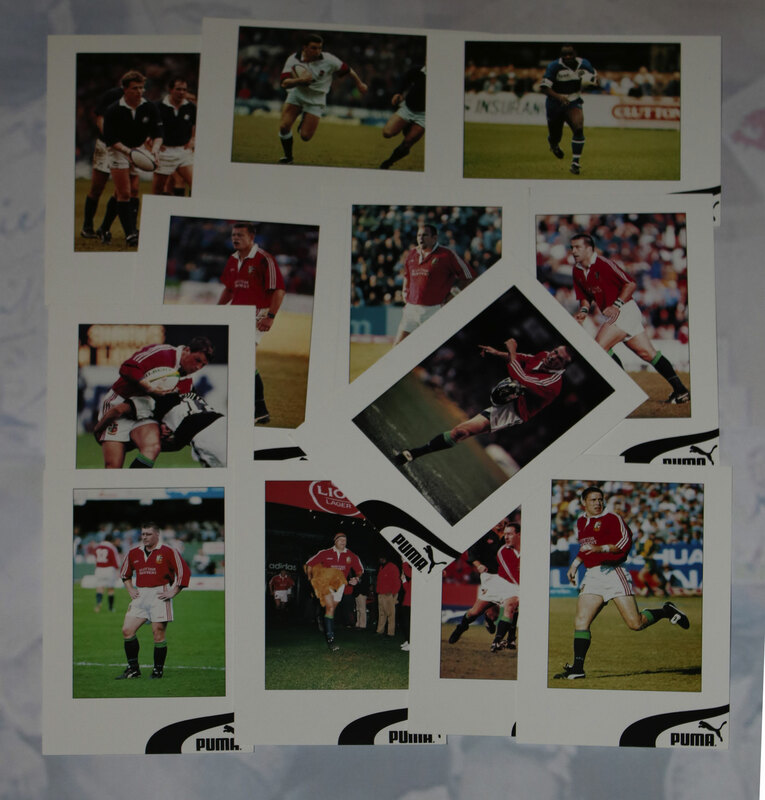 The Lions cards in this collection include Matt Dawson, Alan Tait, Allan Batemen, Dai Young, Scott Gibbs, Scott Quinnell & John Bently identification. 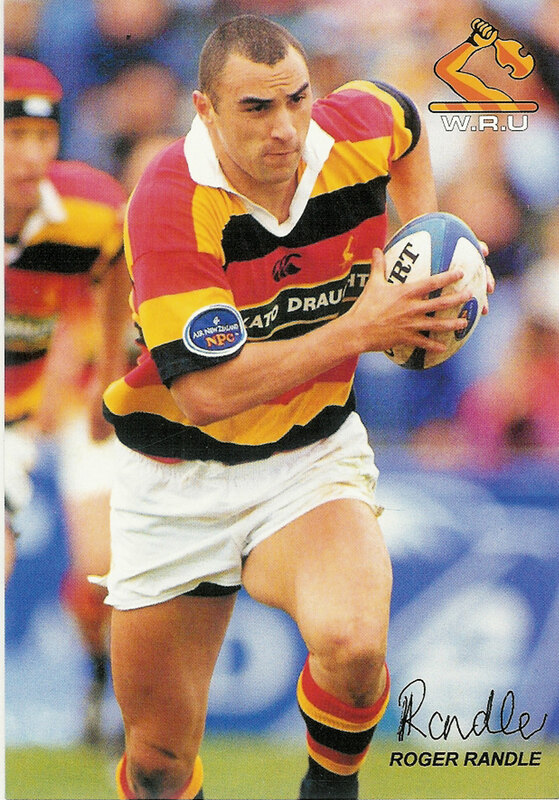 Other cards include Craig Chalmers & Jon Sleightholme. 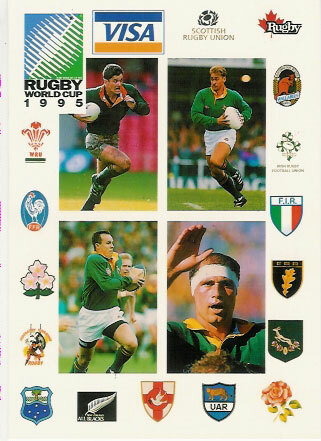 All cards are in very good condition. 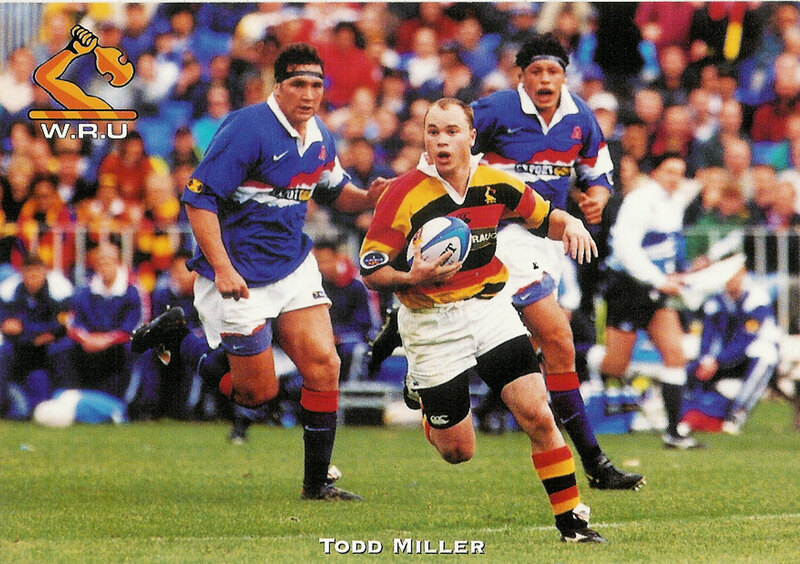 A COLLECTION of 8 PRINTED RUGBY CARDS - A selection of 8 printed cards, all with the subject of rugby union. 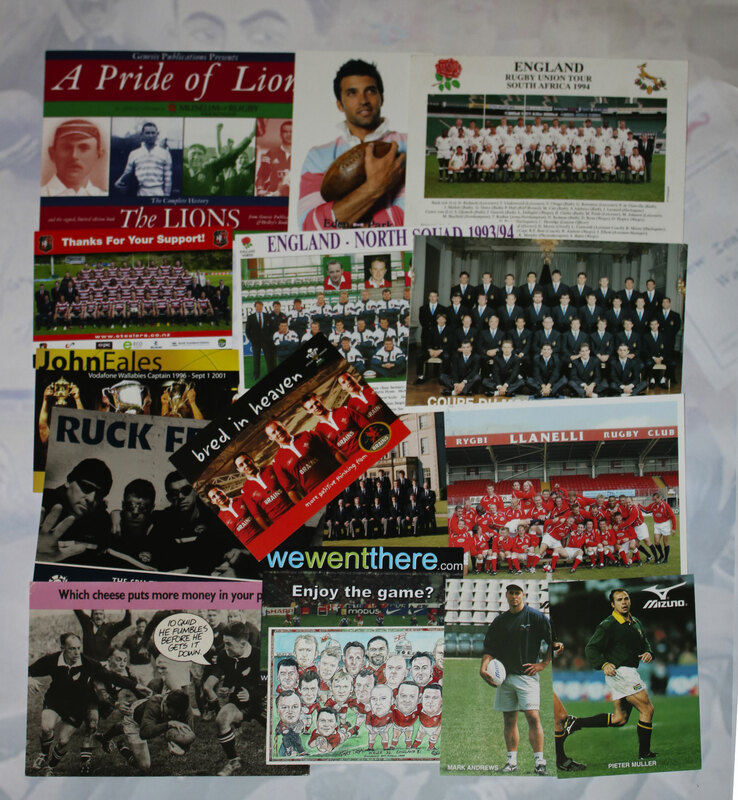 Mostly postcard and large postcard sized cards to include a Lions book, Steelers, NZ, Eden Park, England squad printed card with printed autographs on reverse, Llanelli & Scottish Cup Final card & 2 x Springbok player Mizuno promo cards. All in very good condition. 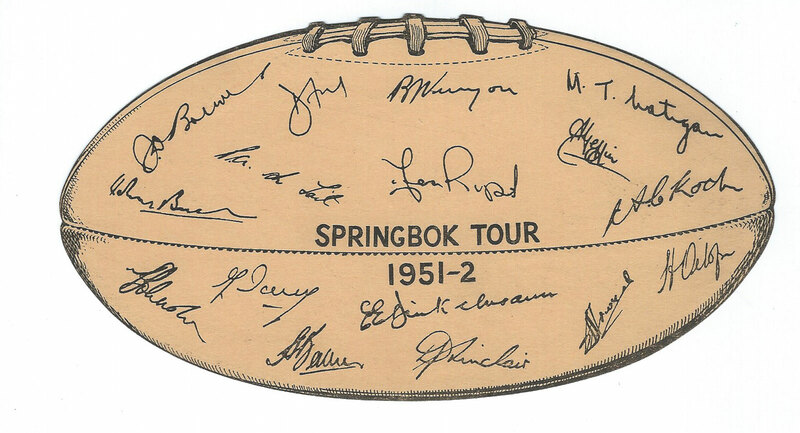 SPRINGBOK TOUR 1951-2 PRINTED AUTOGRAPHS CARD - A rugby ball shaped card measuring 7" x 4" containing the printed signatures from the 1951-2 South African tour party to Great Britain & Ireland. 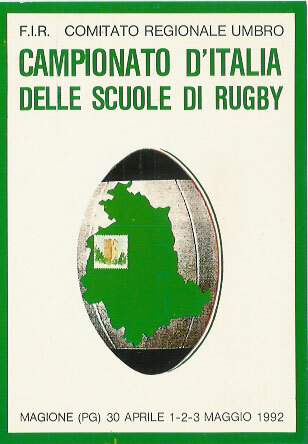 The card is original and dates from this period. 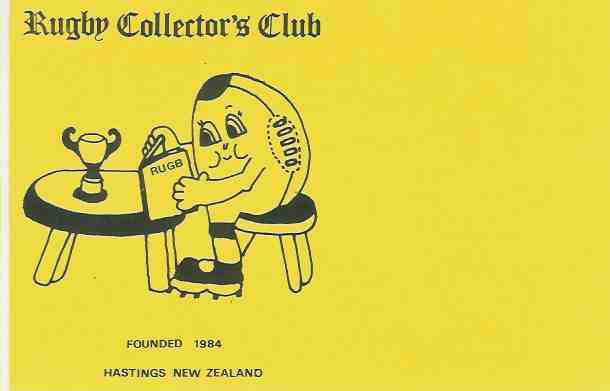 "Football Roo" - a fold over plain greetings card designed by John Cook and printed in Australia, used, lengthy and interesting inscription by player unable to make centenary celebrations. 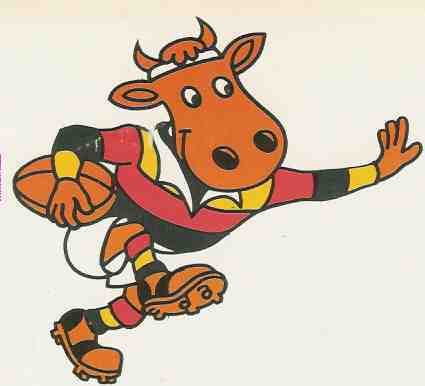 "Mooloo" (Waikato, NZ, mascot) greetings card, used, lengthy inscription dated 1992.